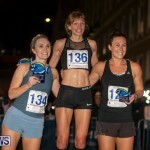 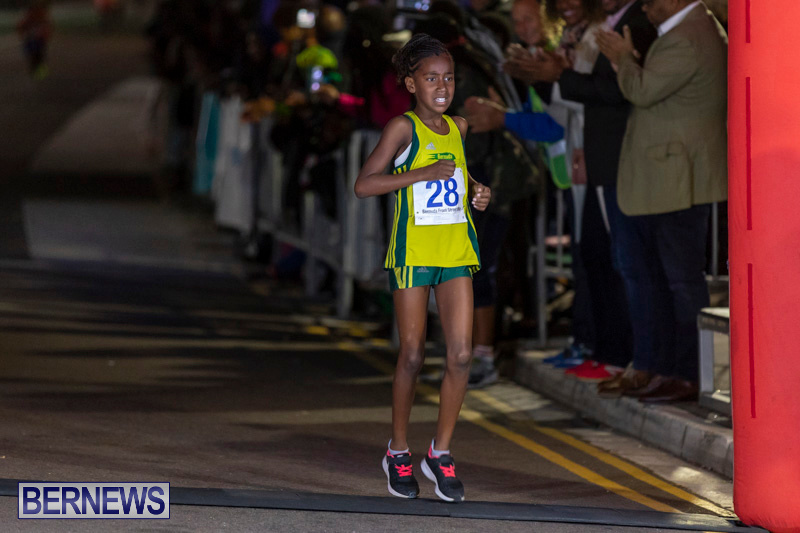 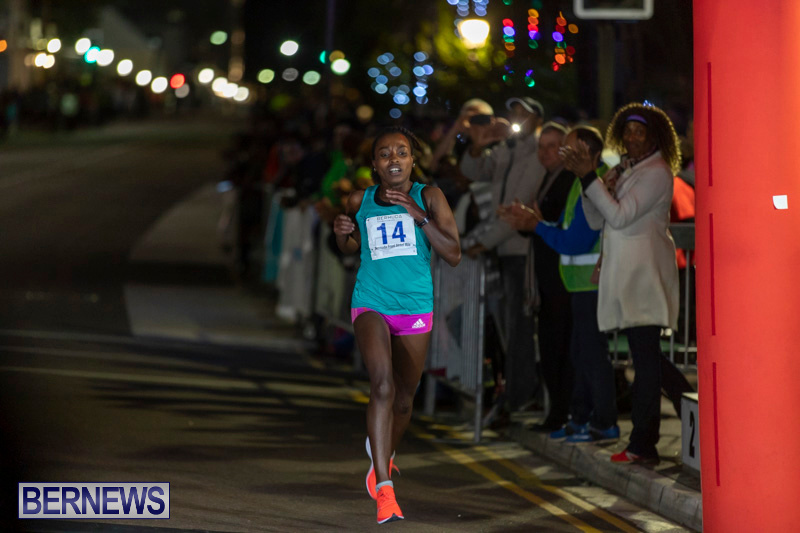 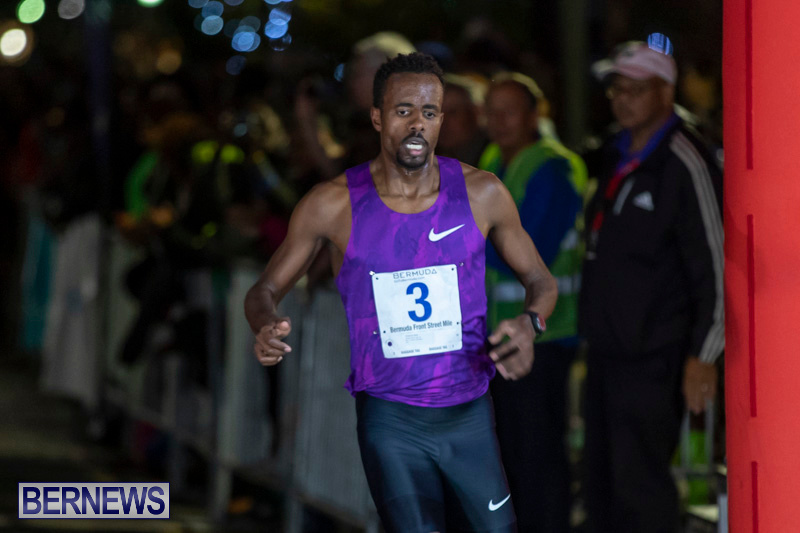 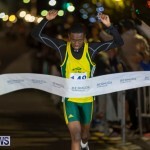 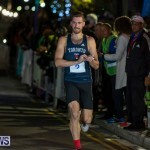 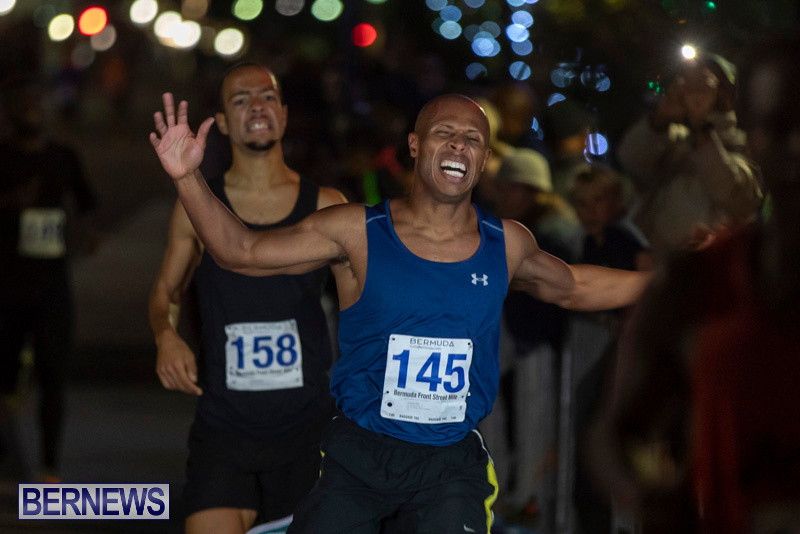 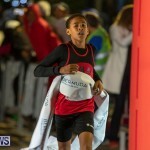 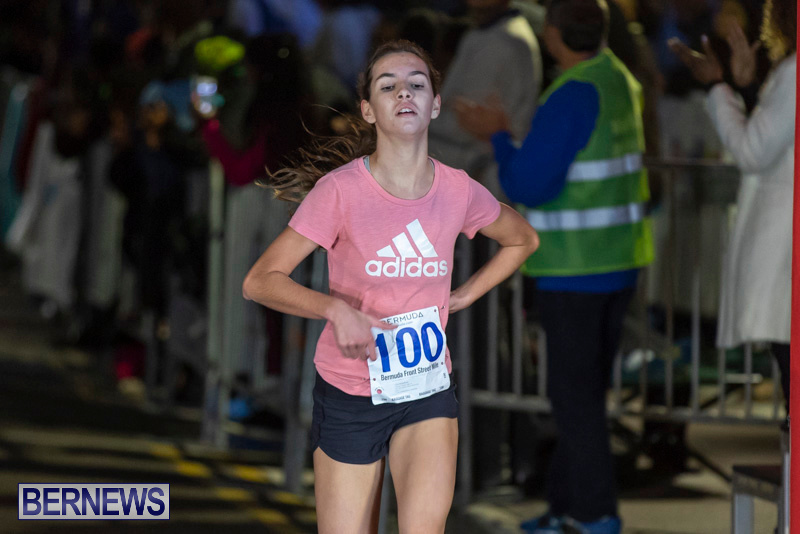 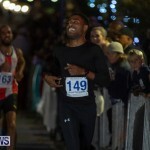 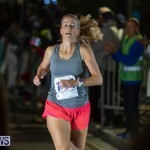 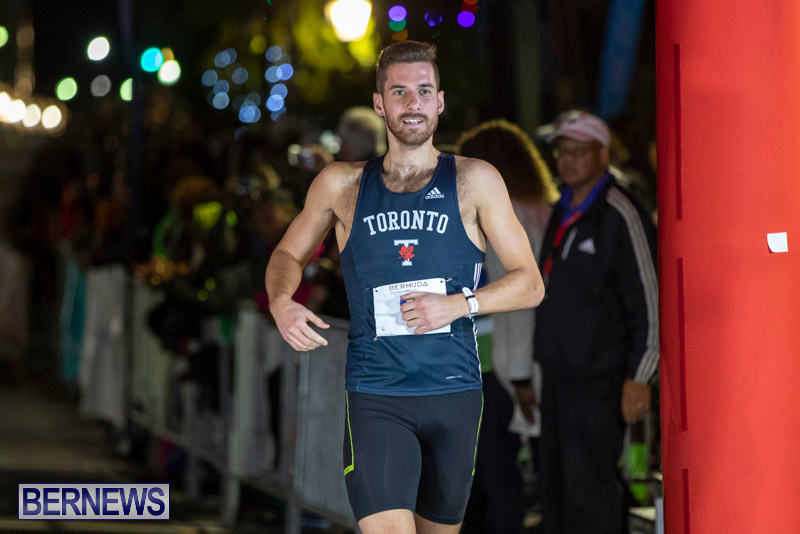 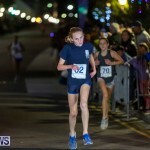 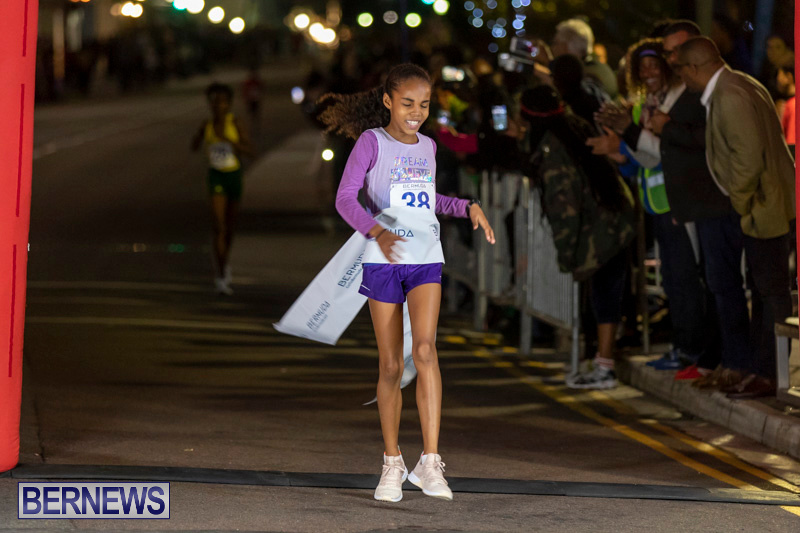 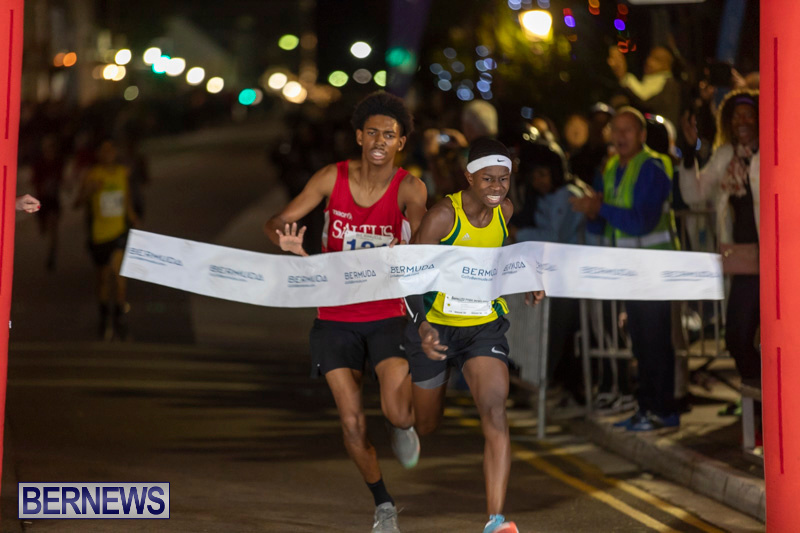 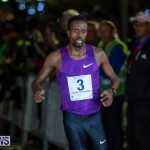 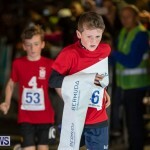 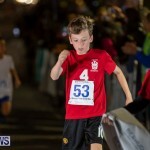 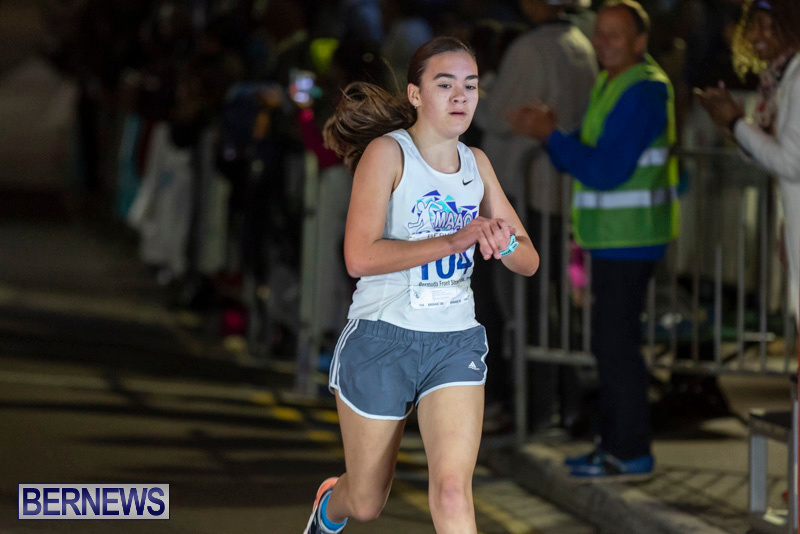 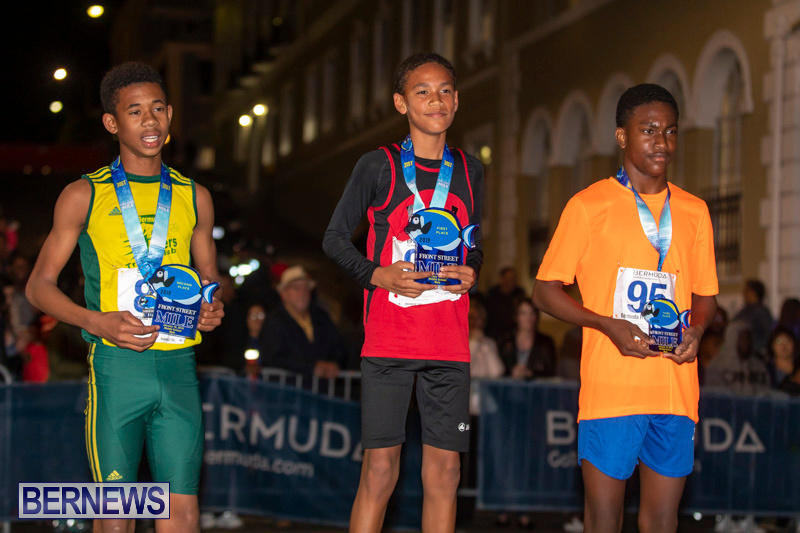 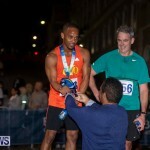 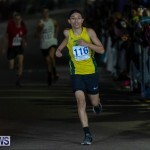 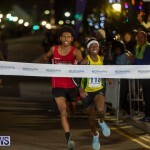 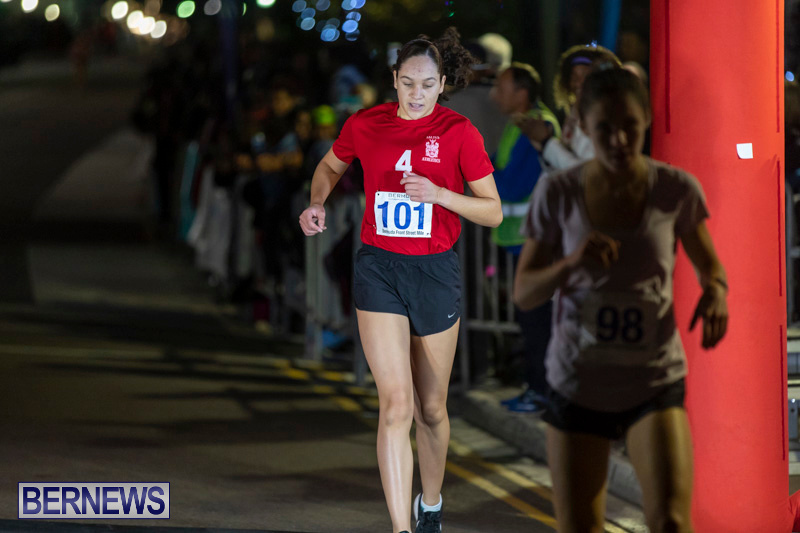 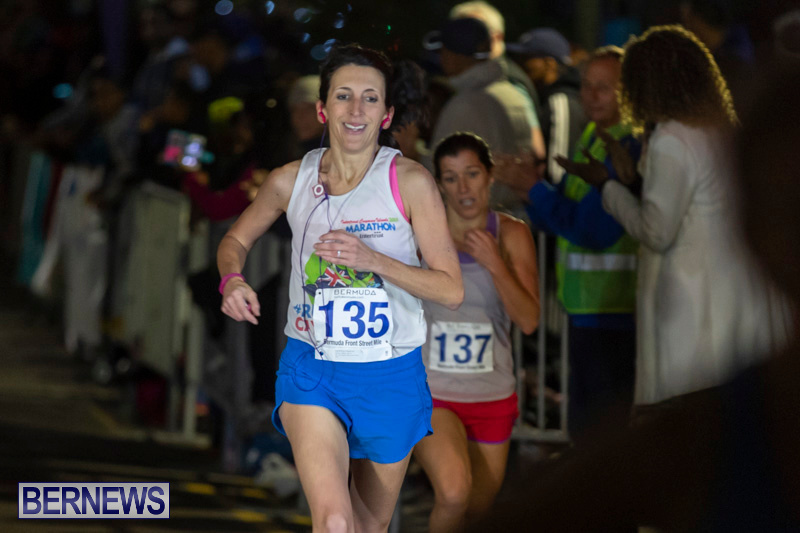 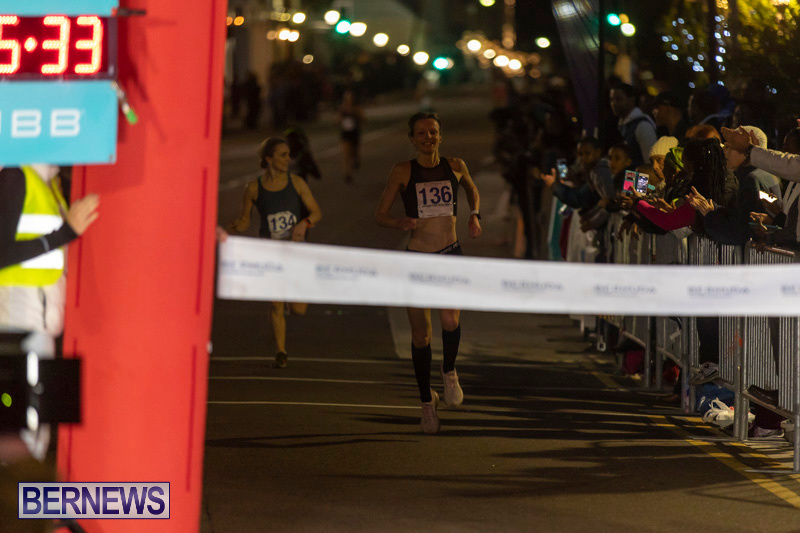 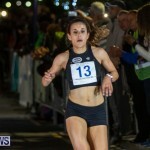 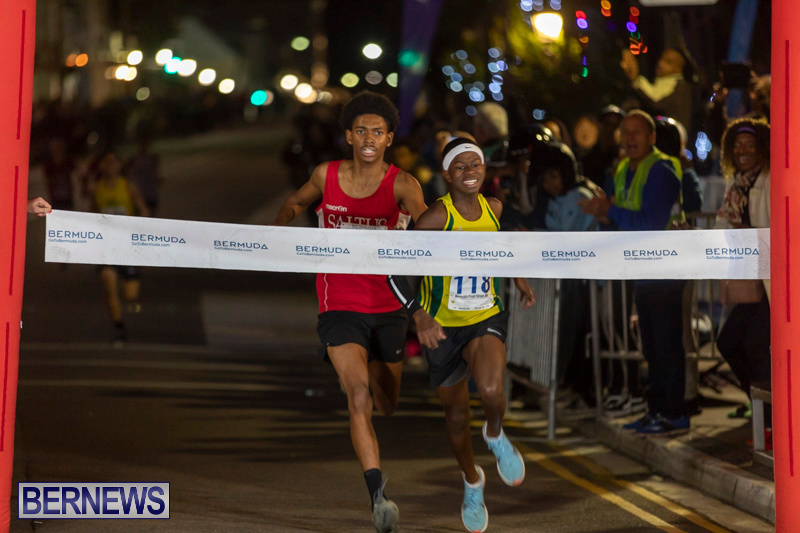 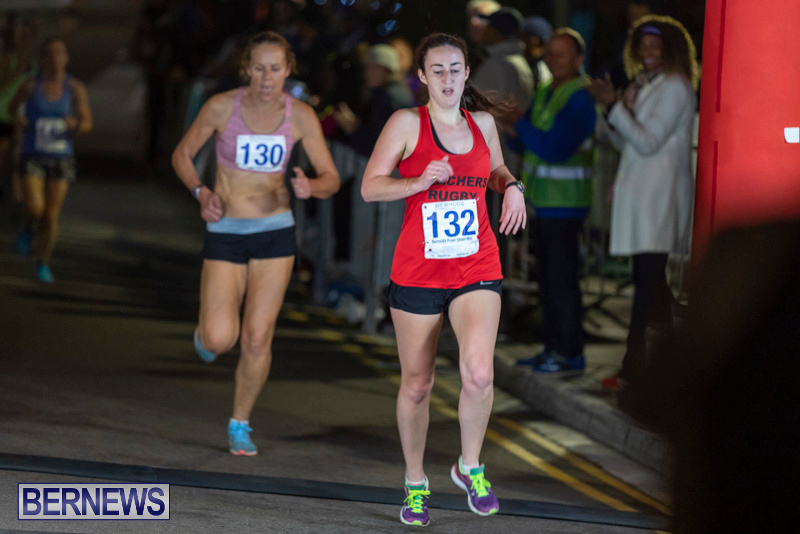 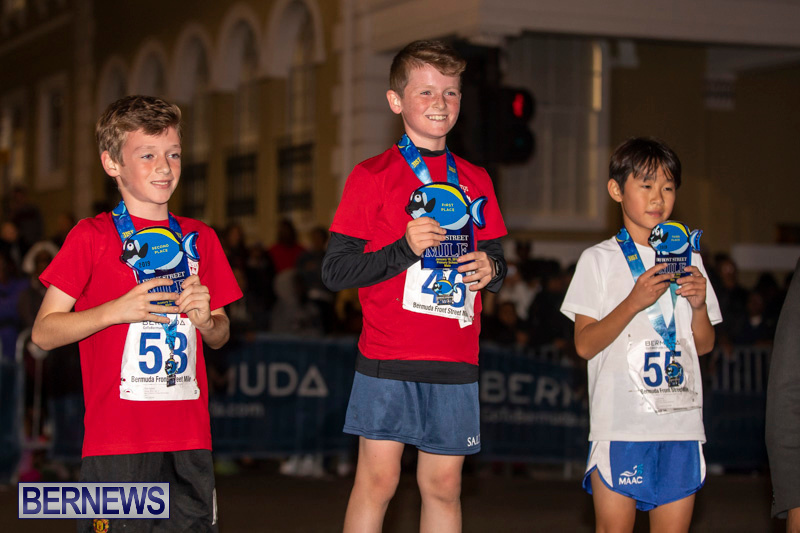 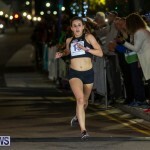 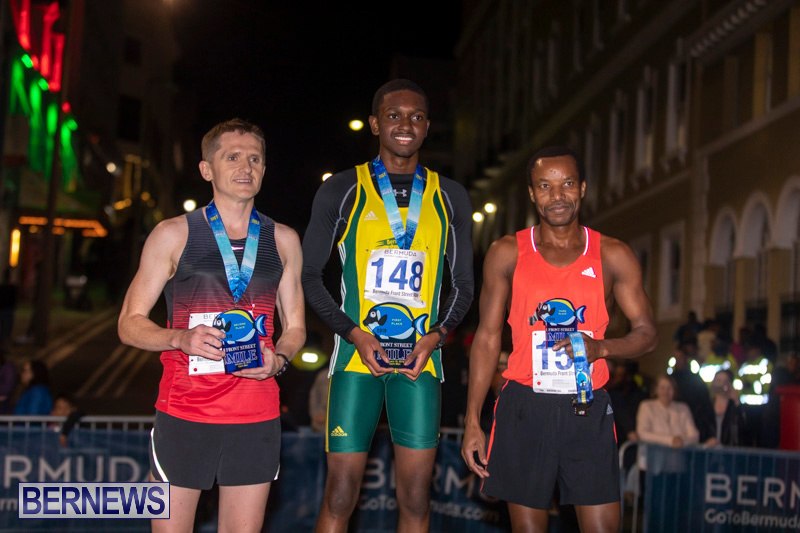 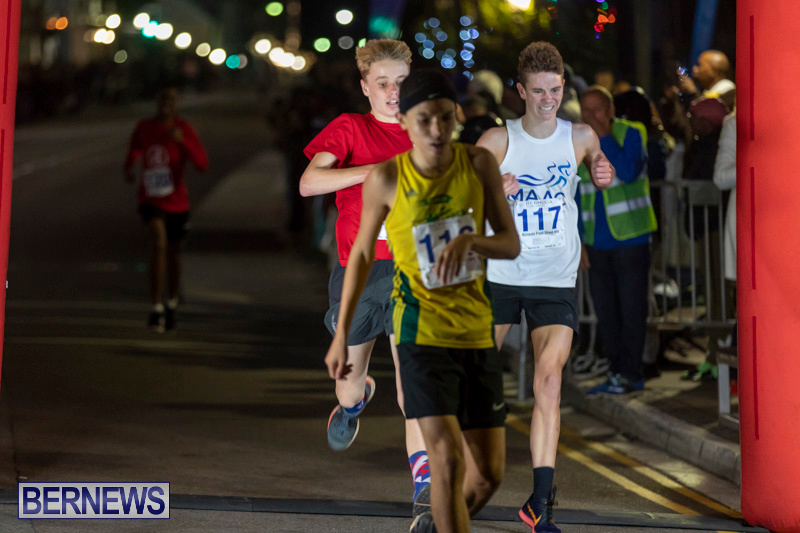 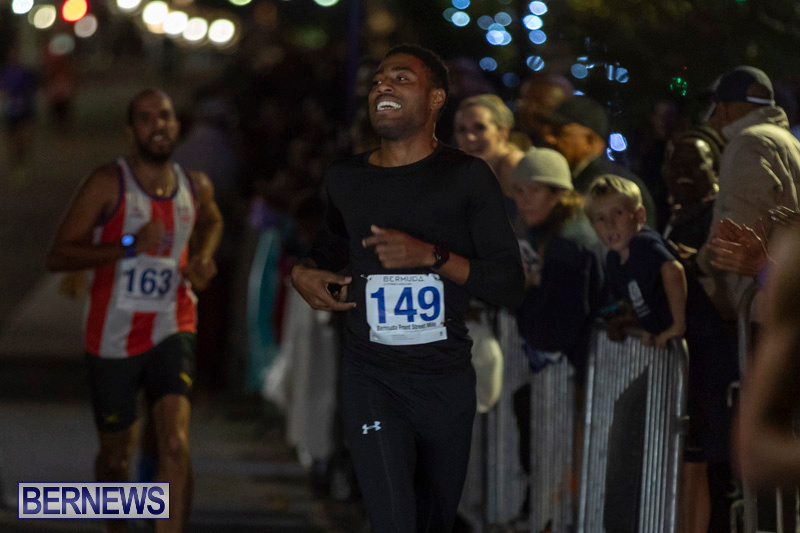 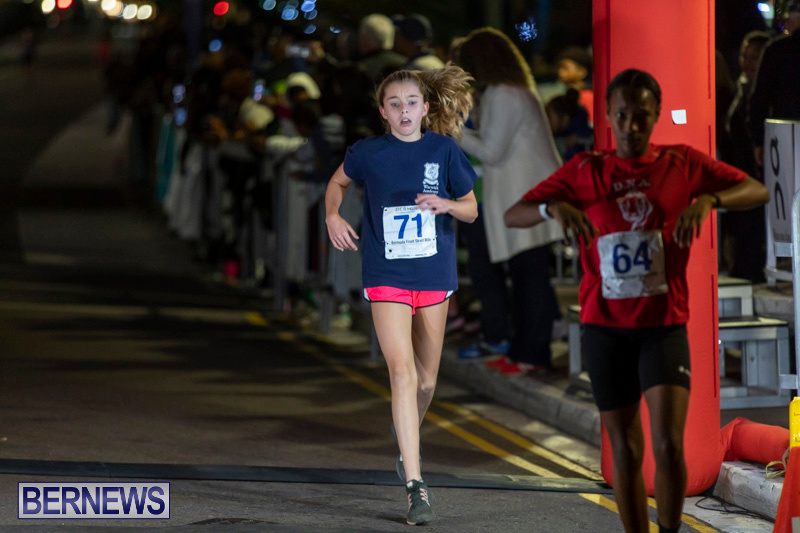 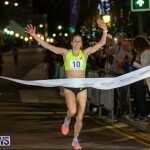 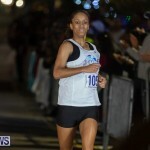 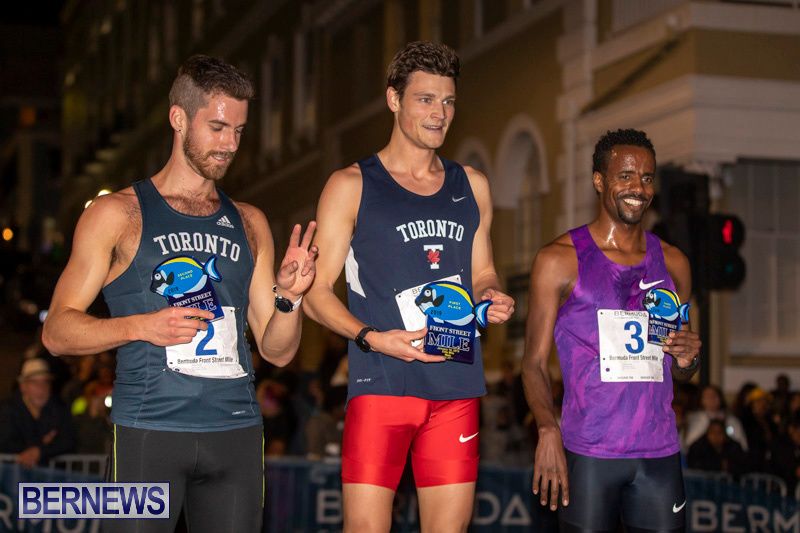 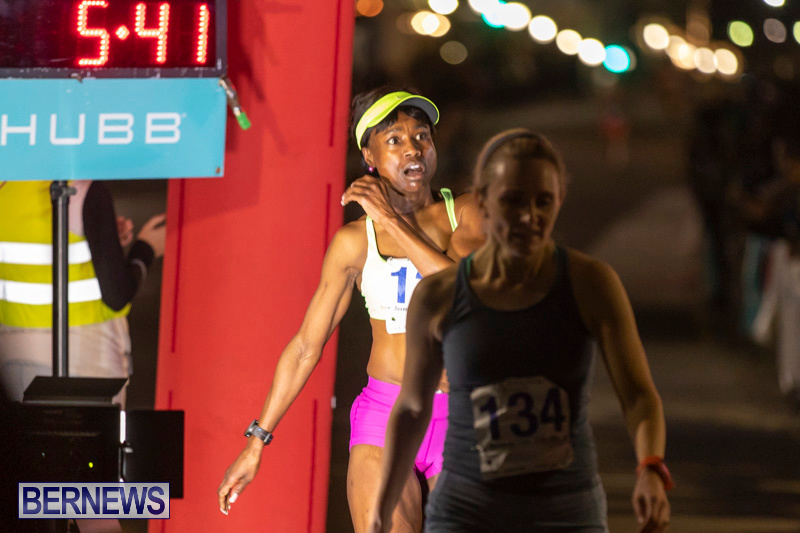 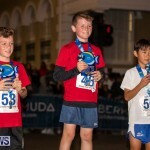 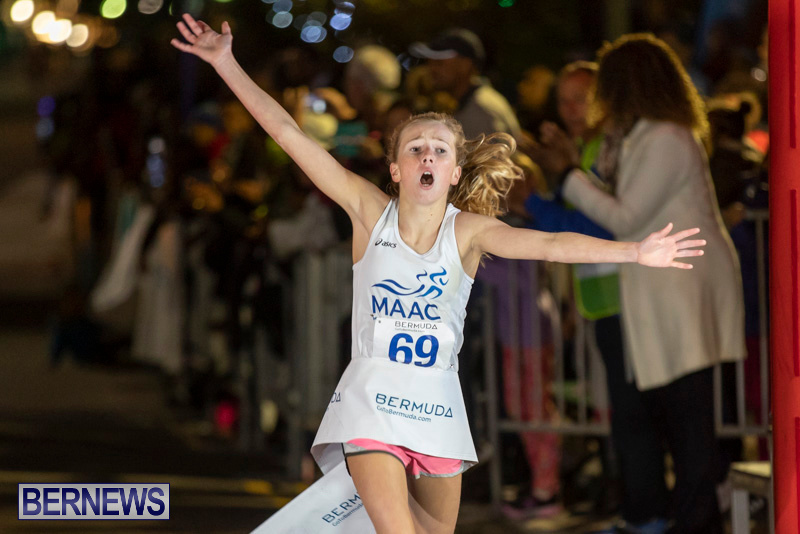 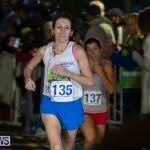 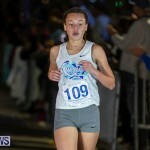 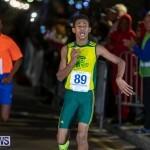 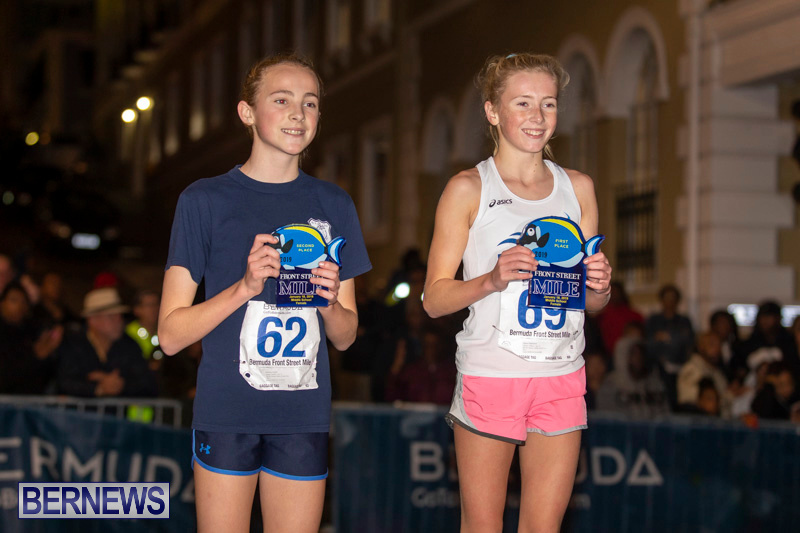 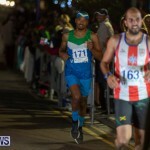 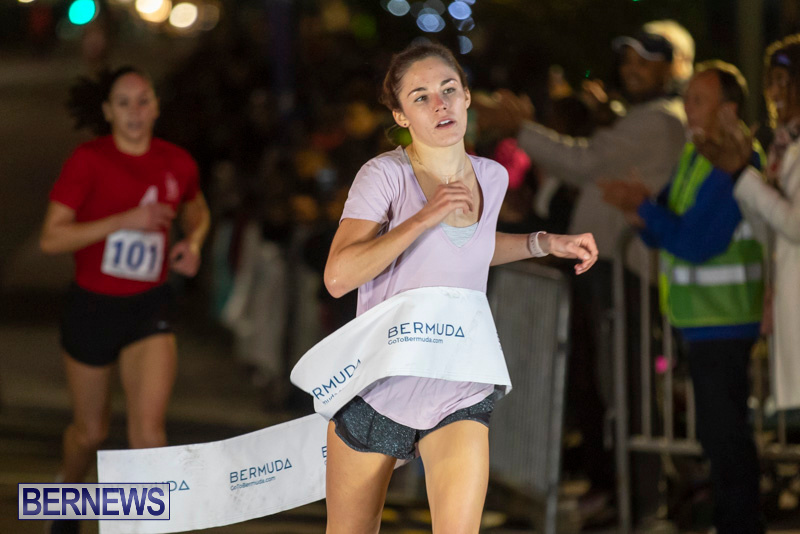 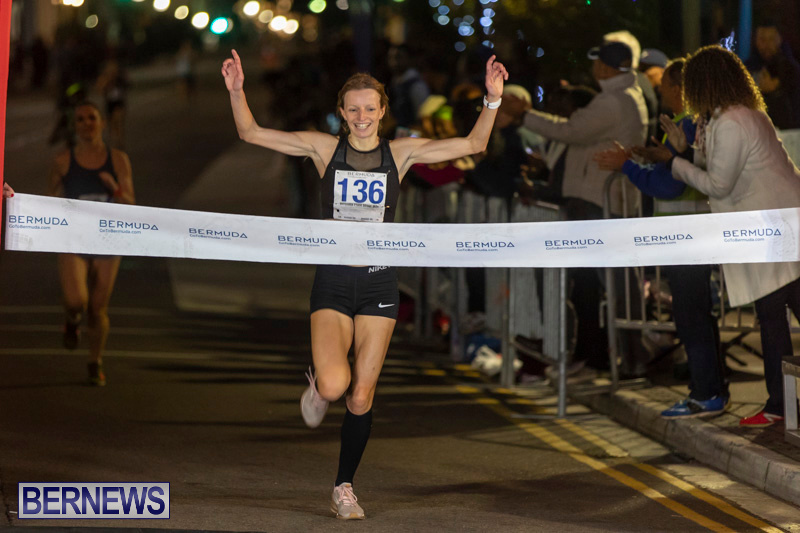 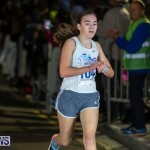 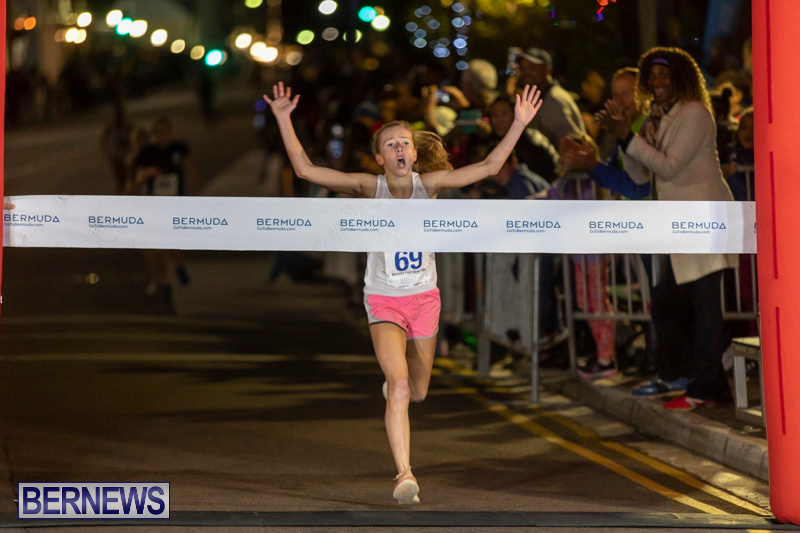 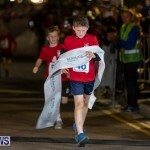 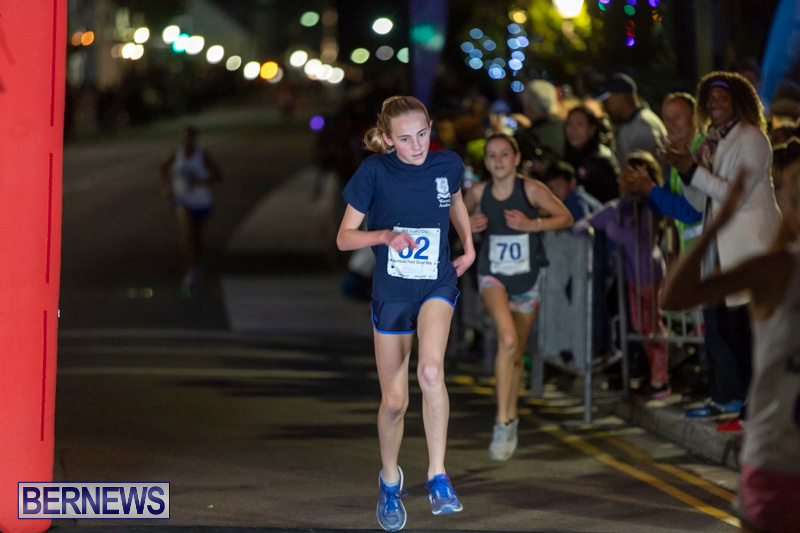 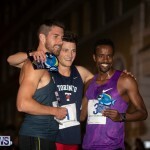 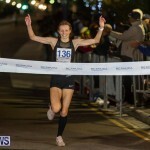 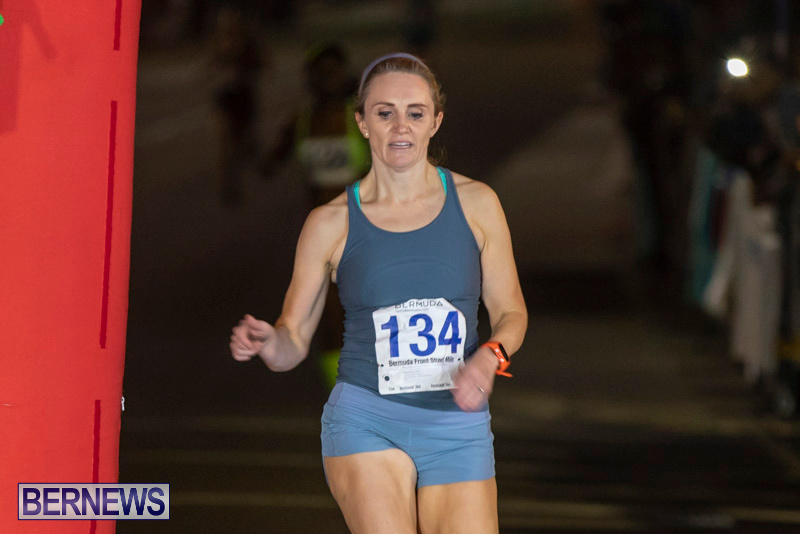 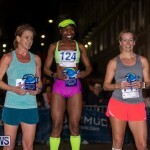 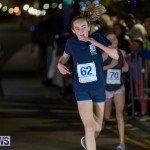 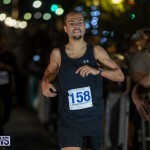 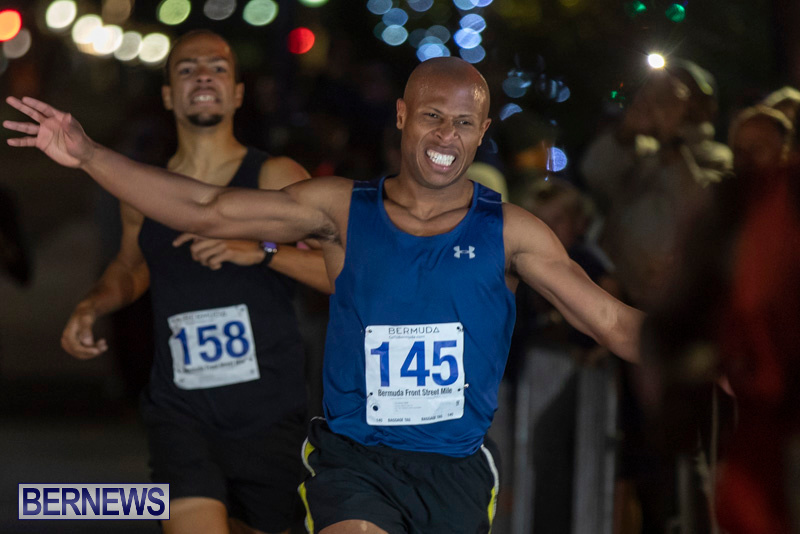 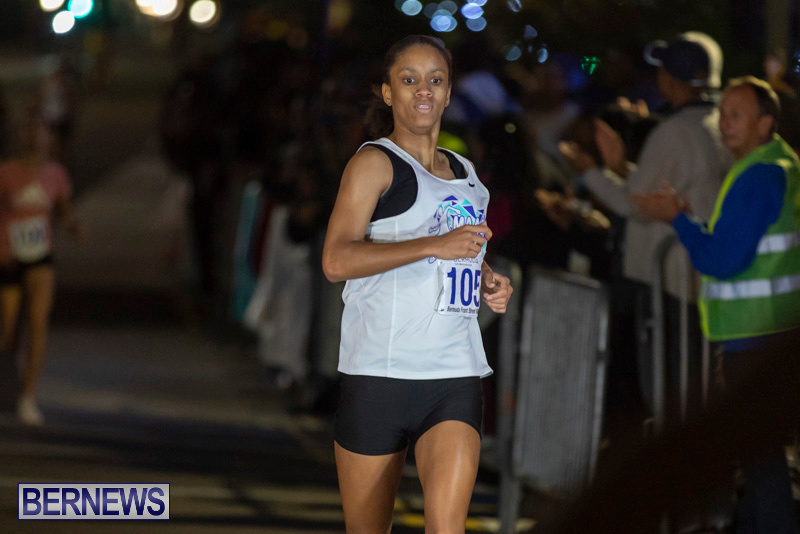 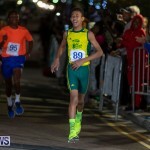 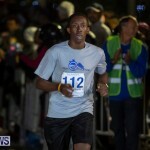 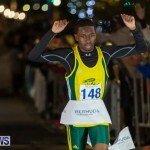 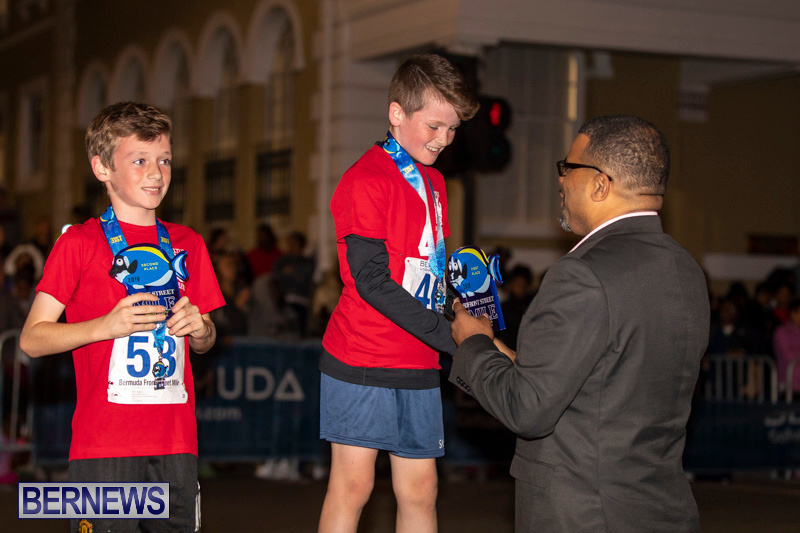 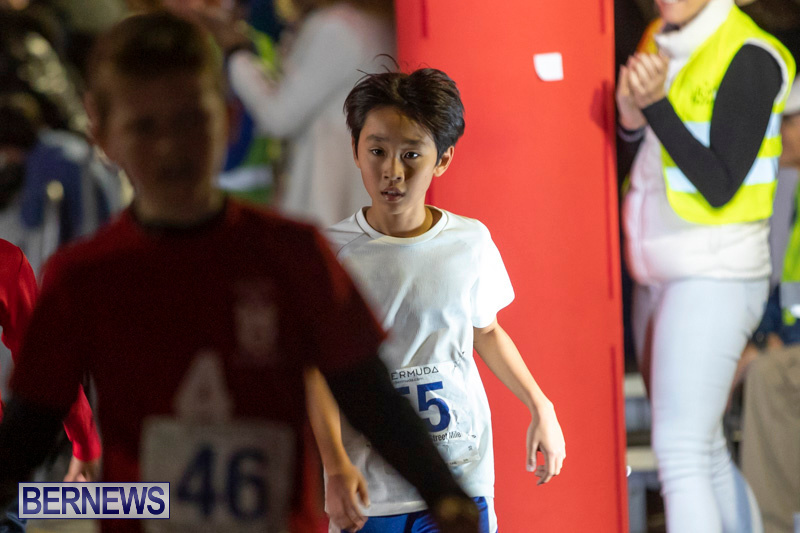 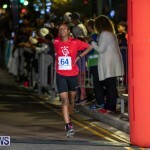 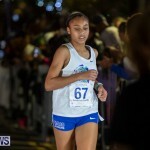 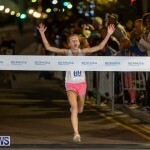 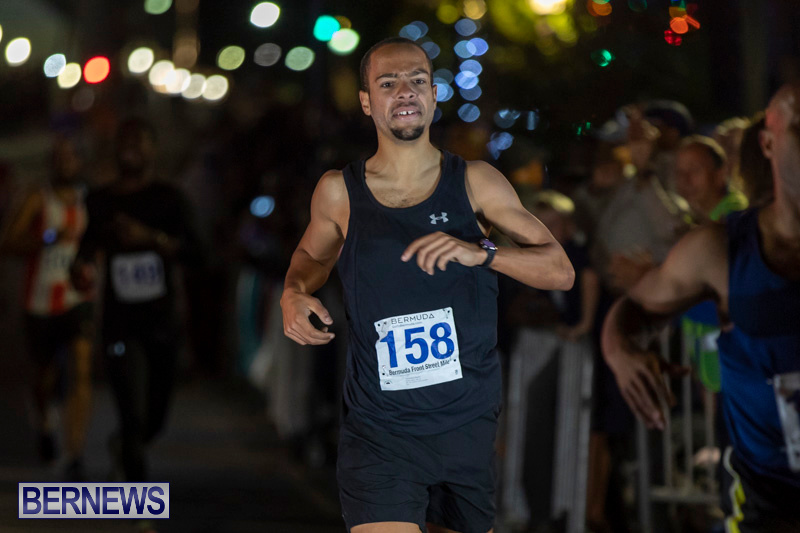 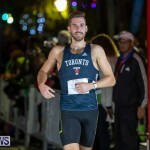 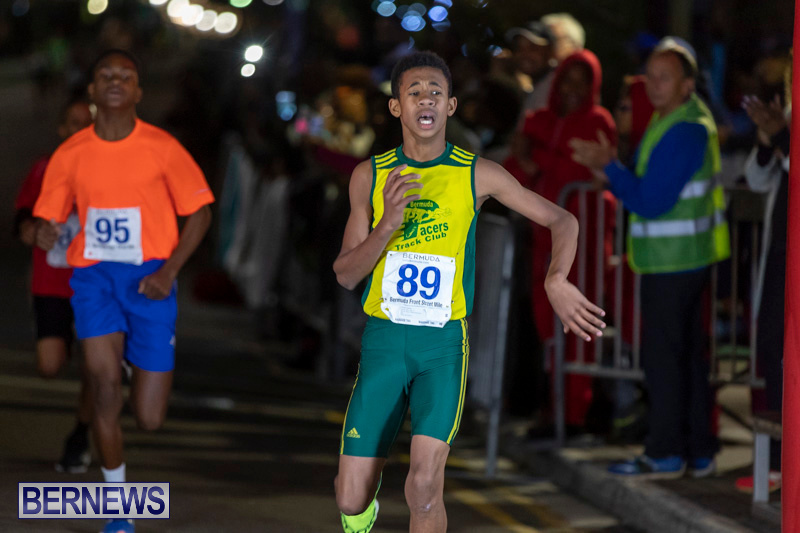 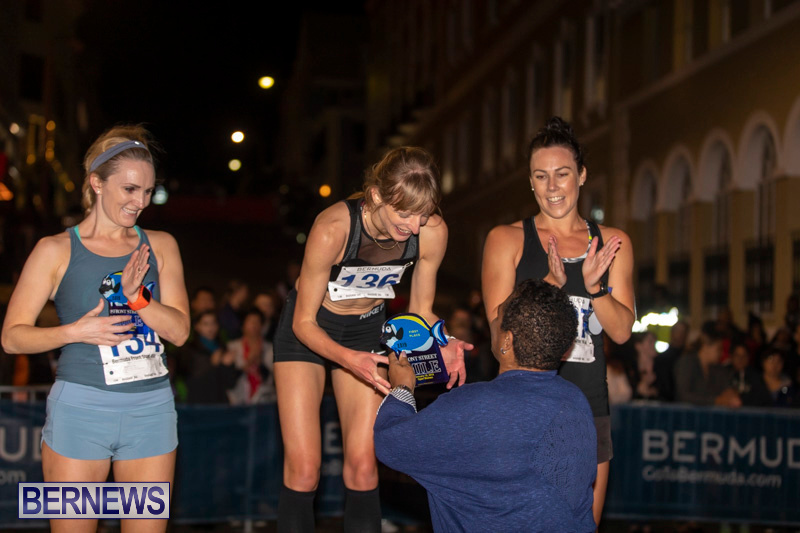 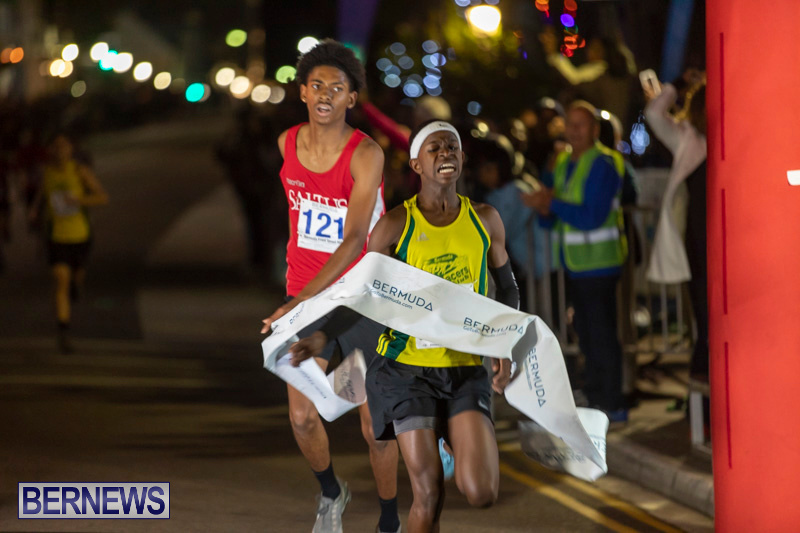 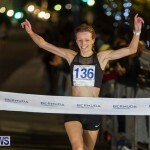 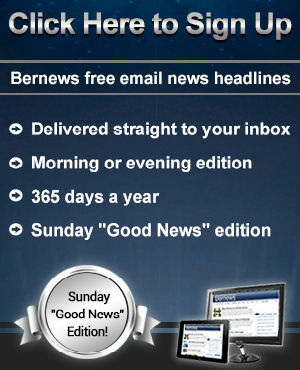 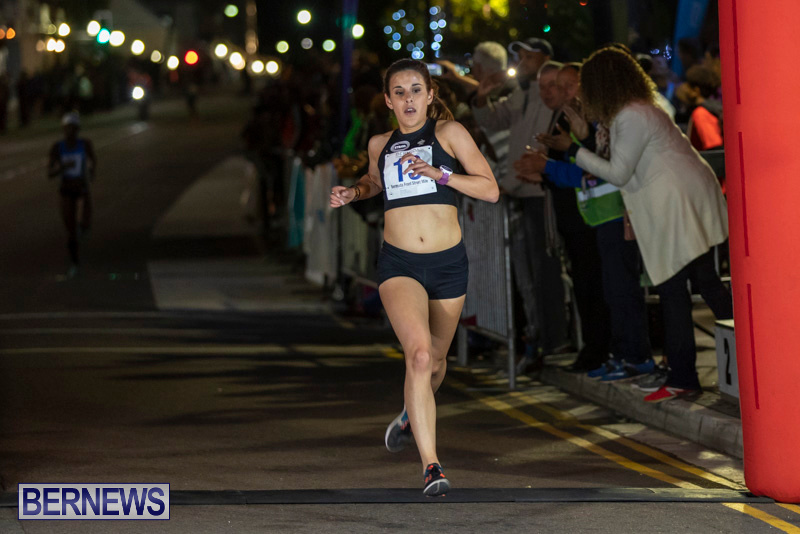 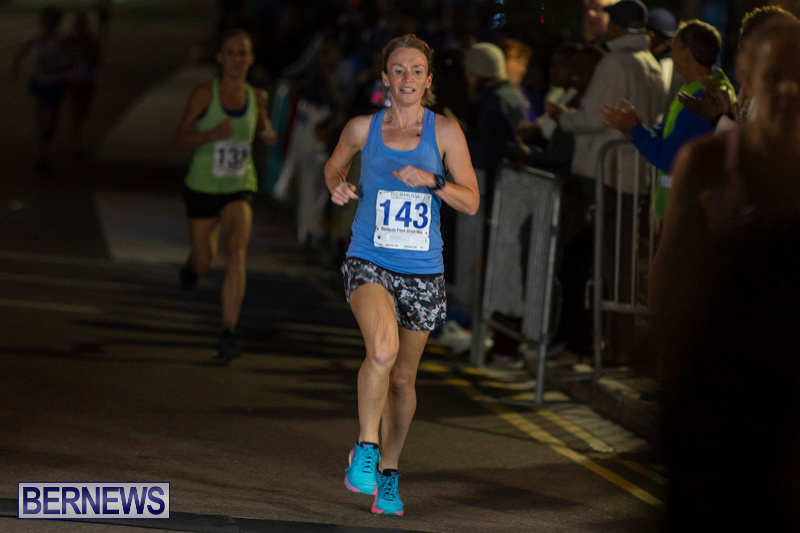 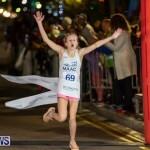 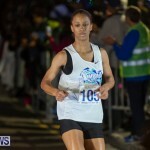 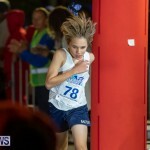 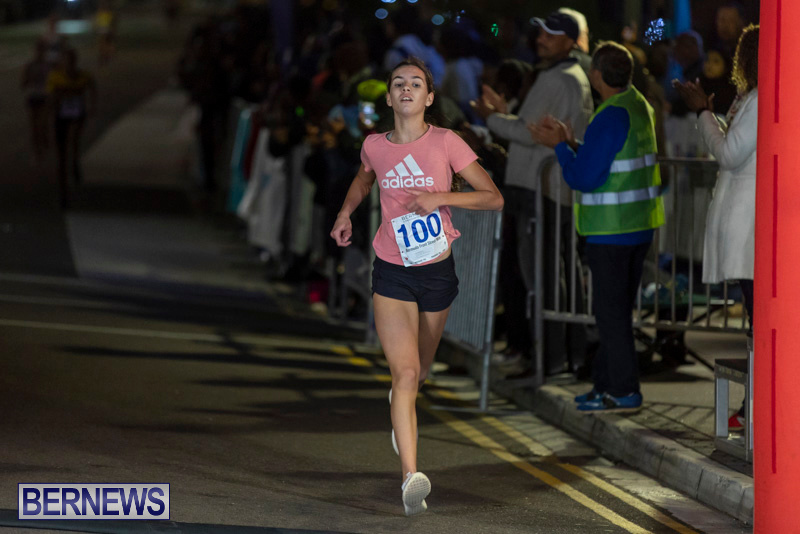 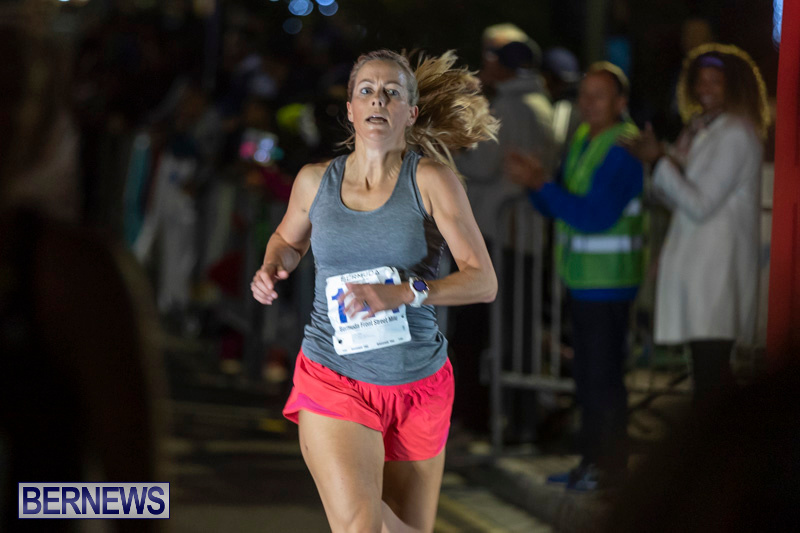 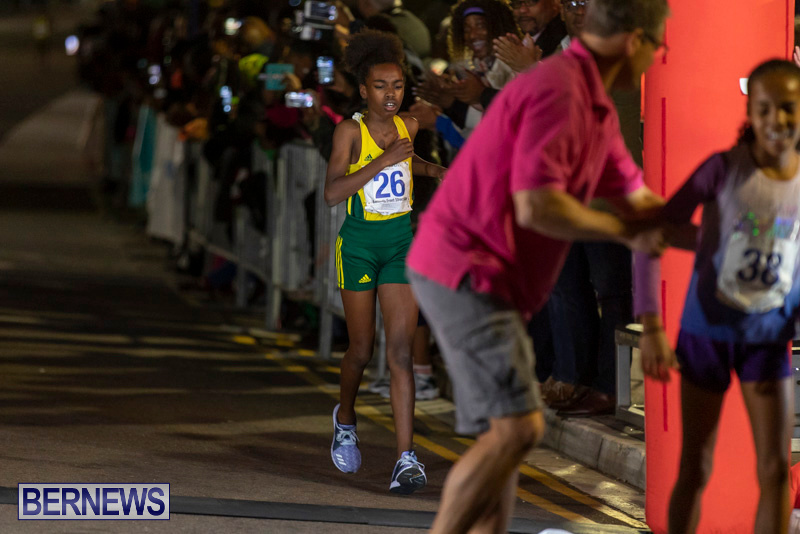 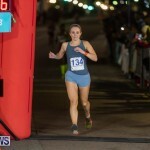 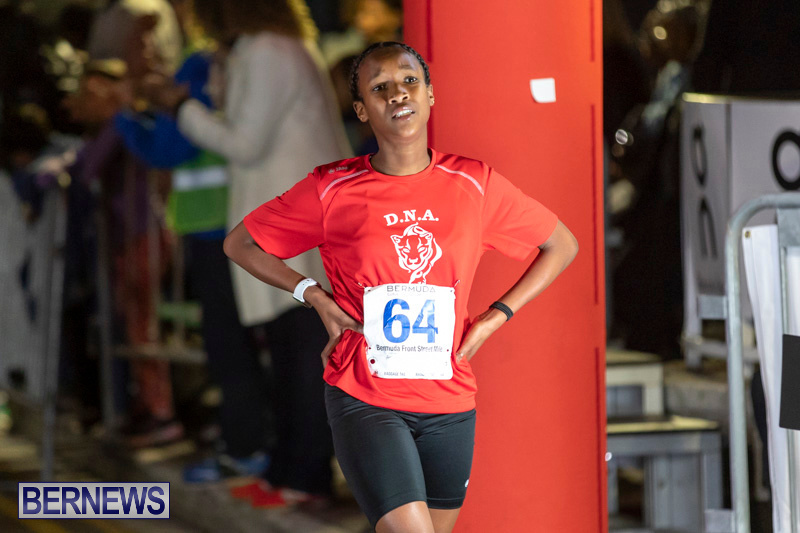 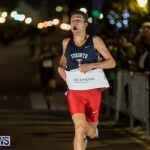 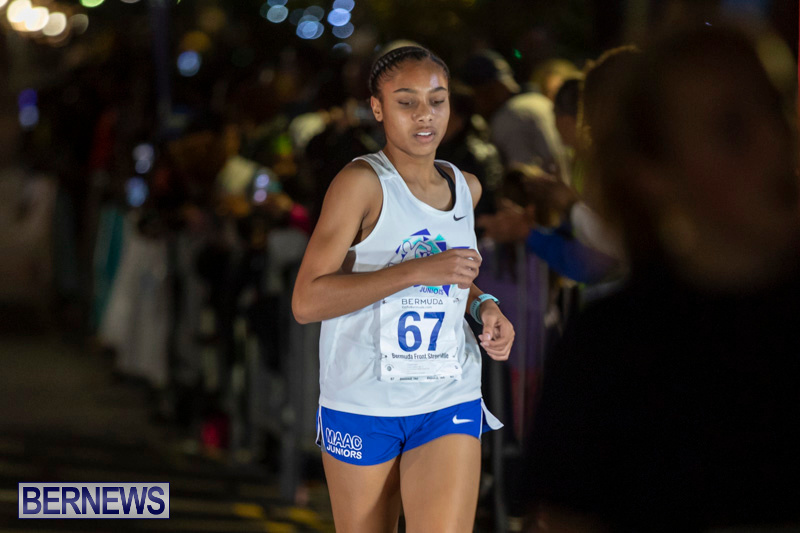 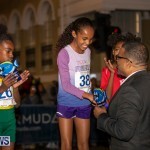 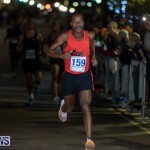 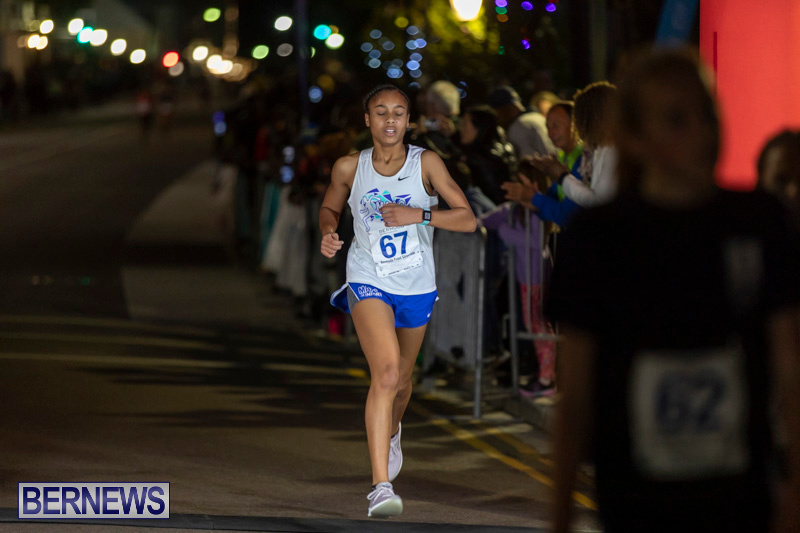 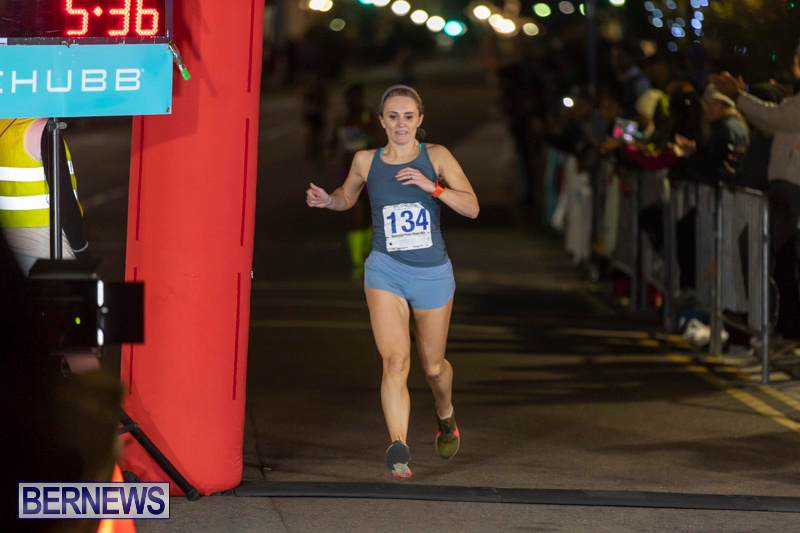 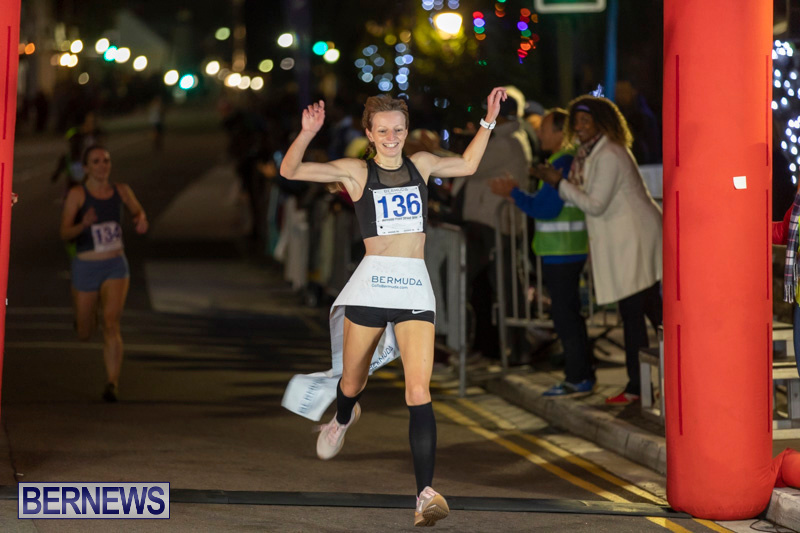 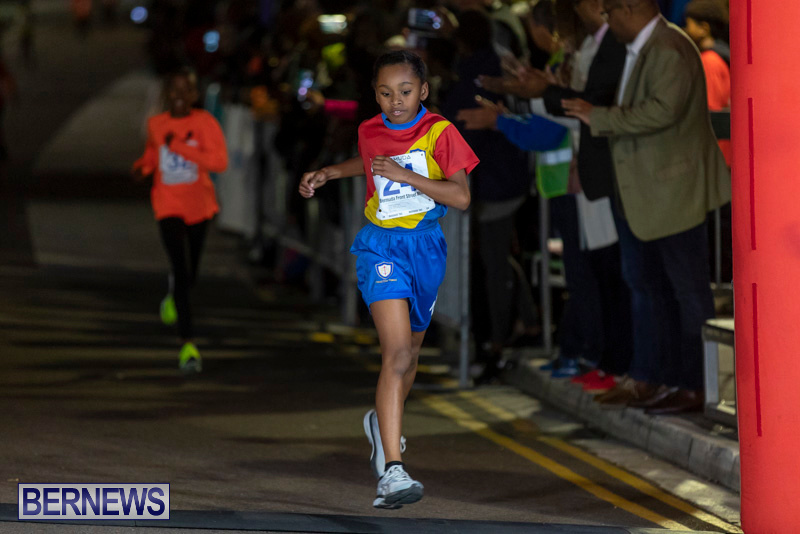 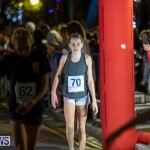 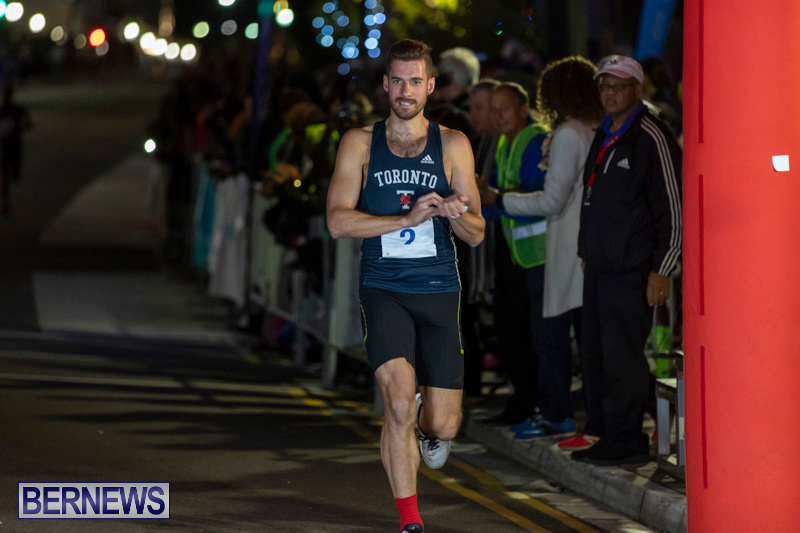 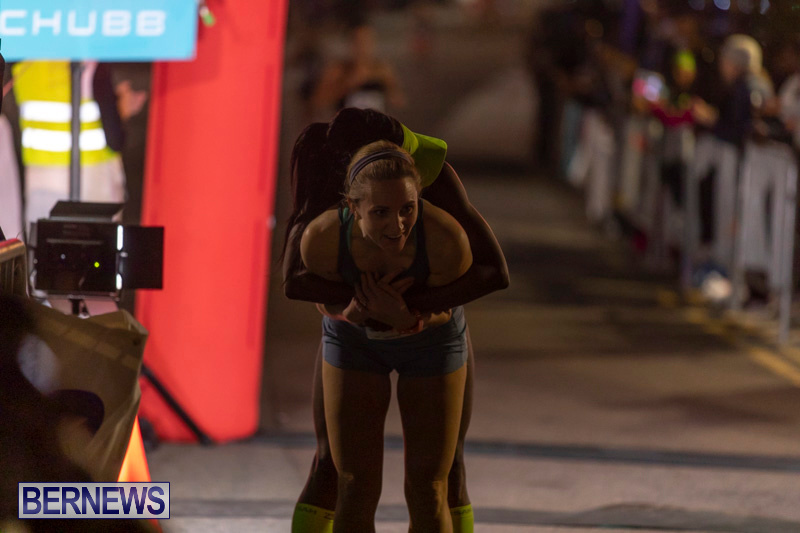 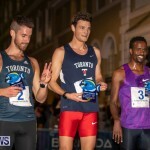 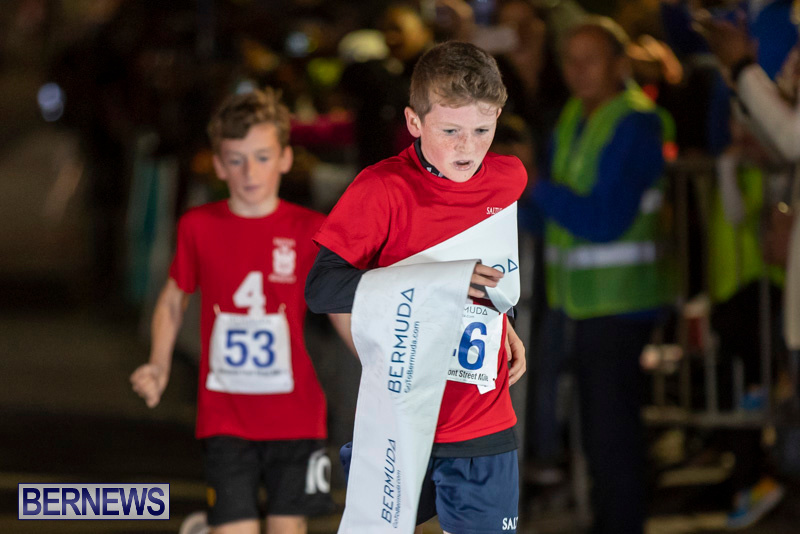 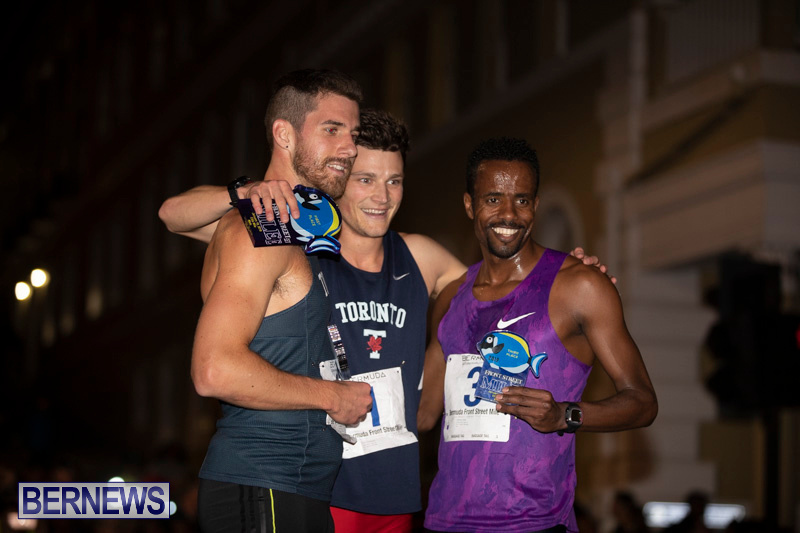 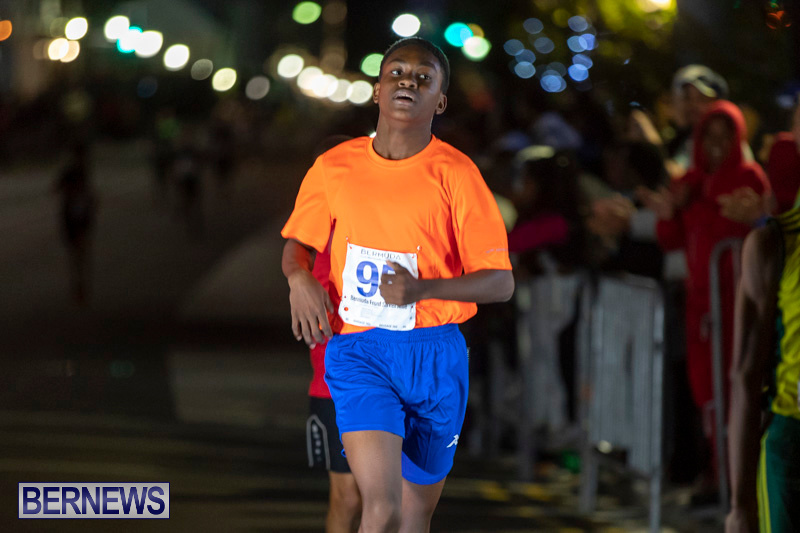 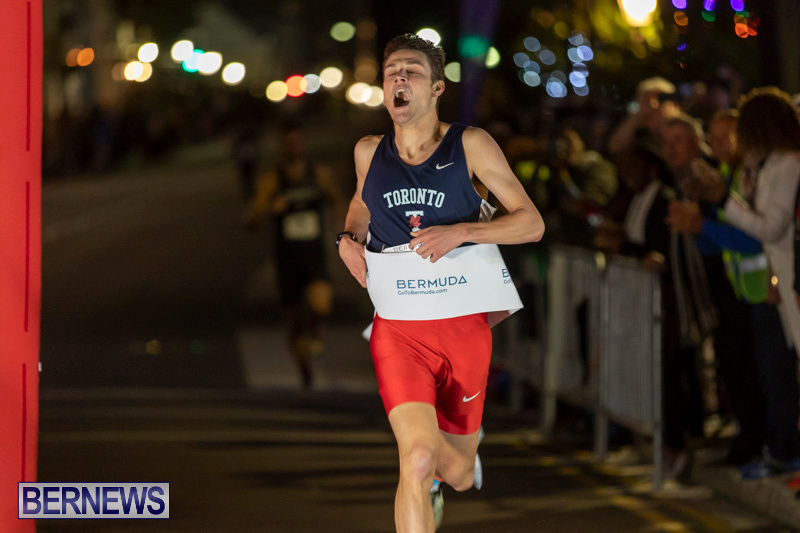 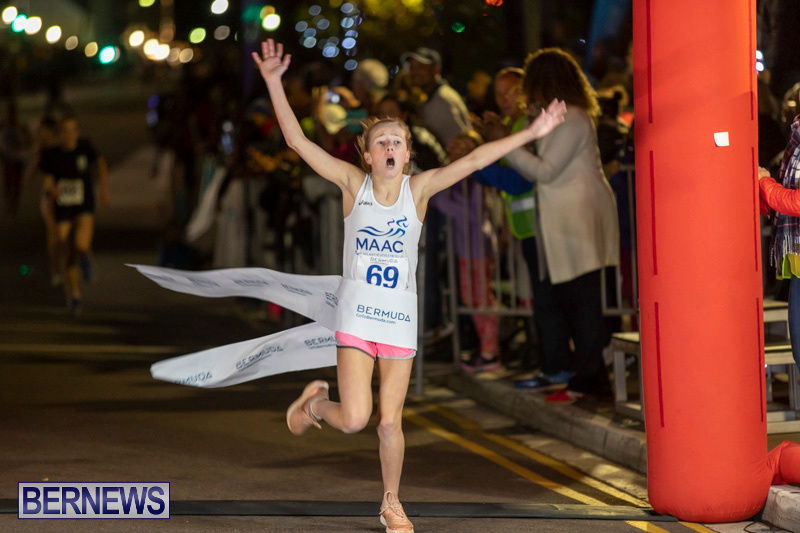 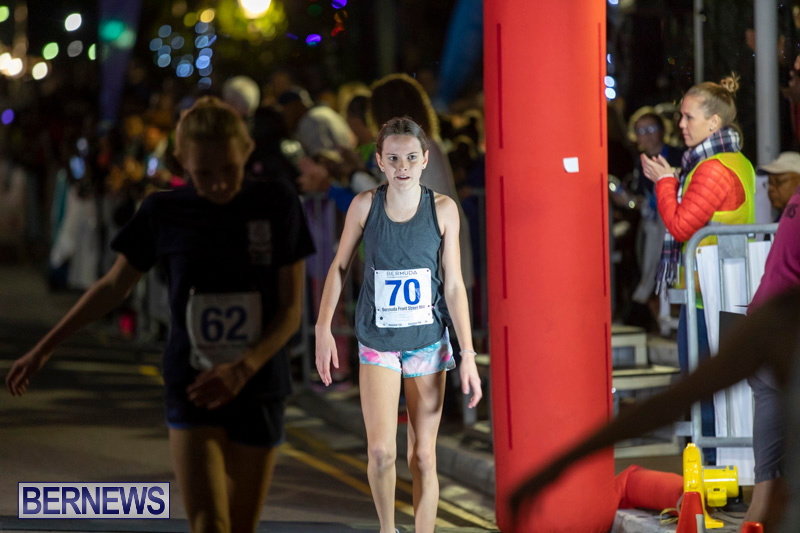 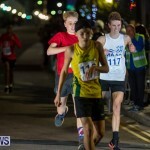 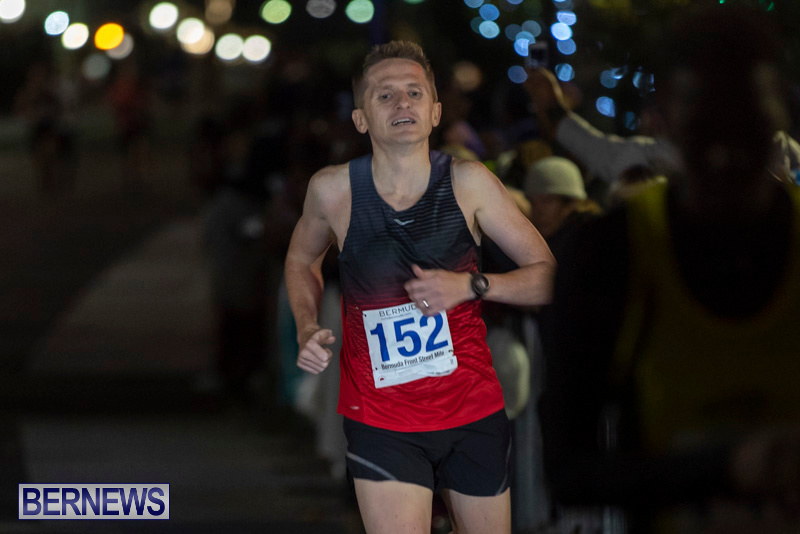 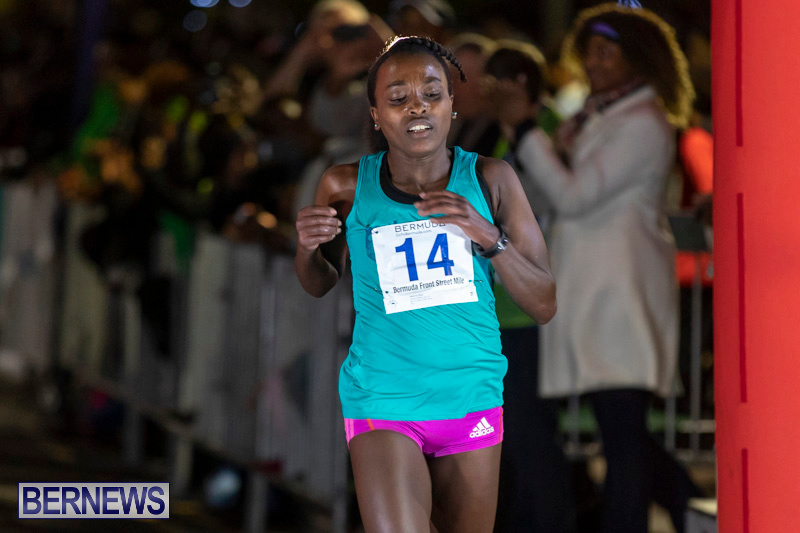 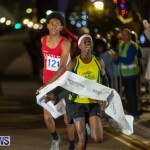 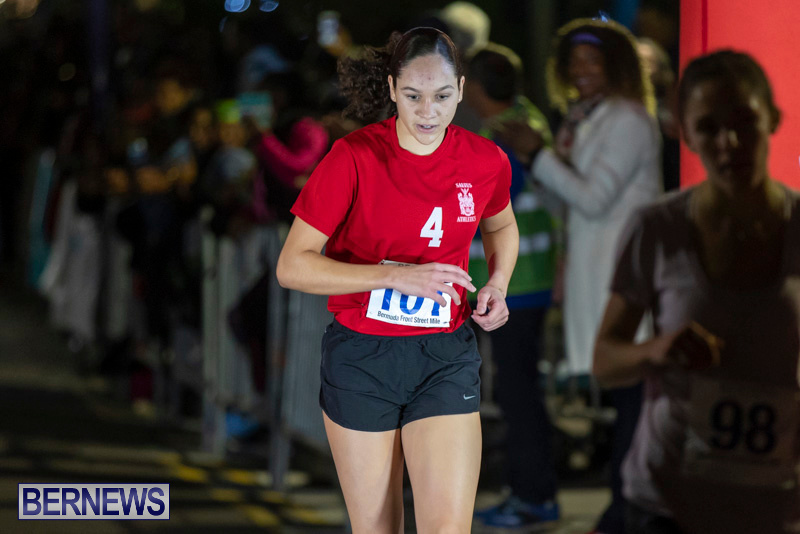 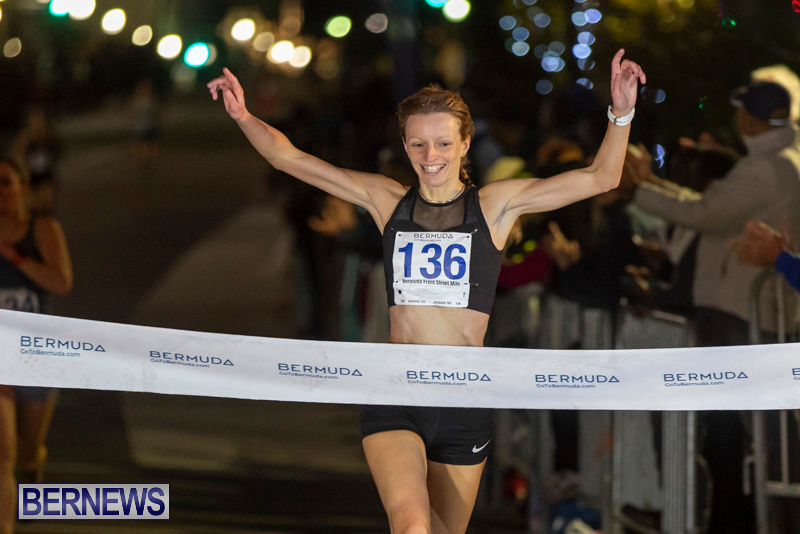 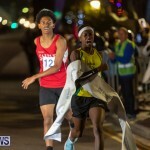 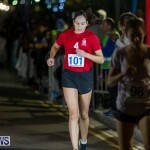 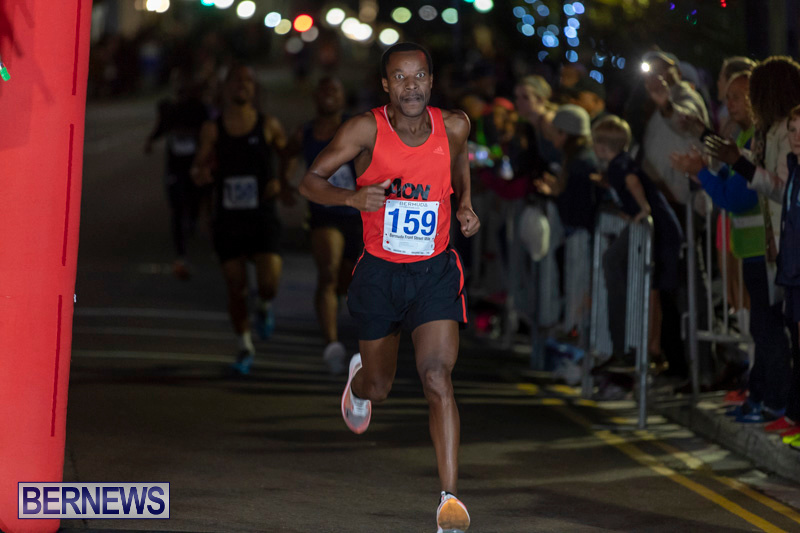 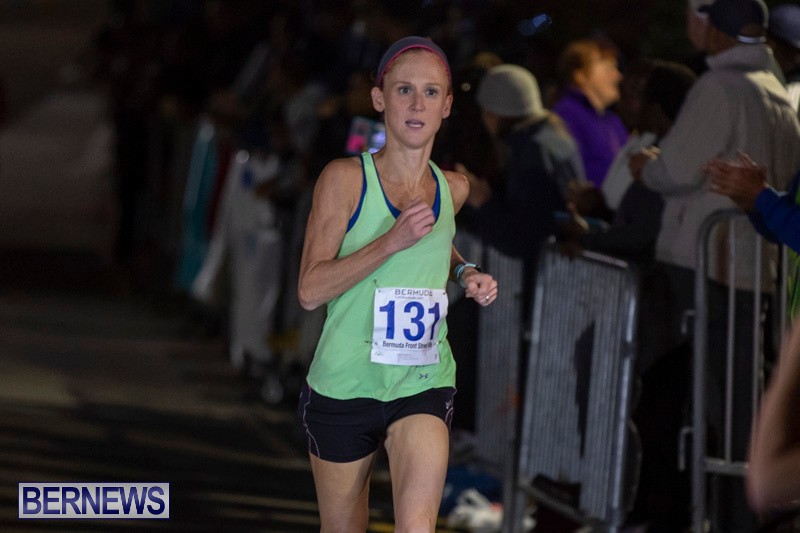 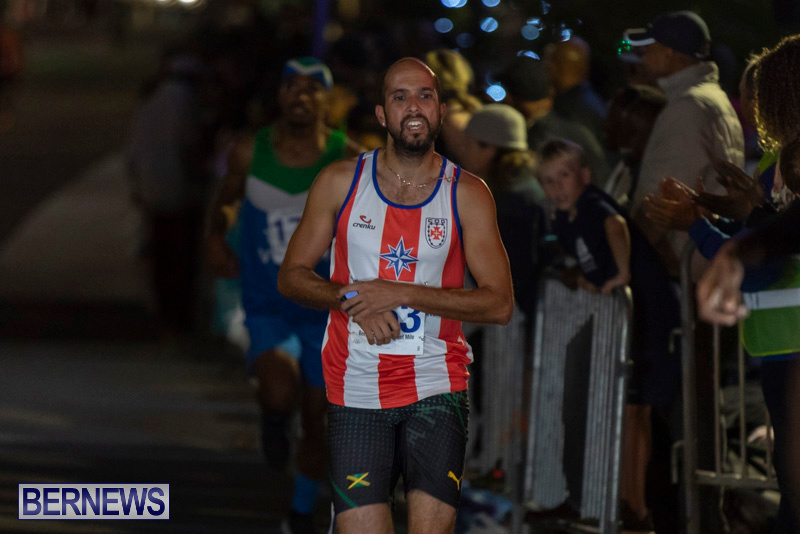 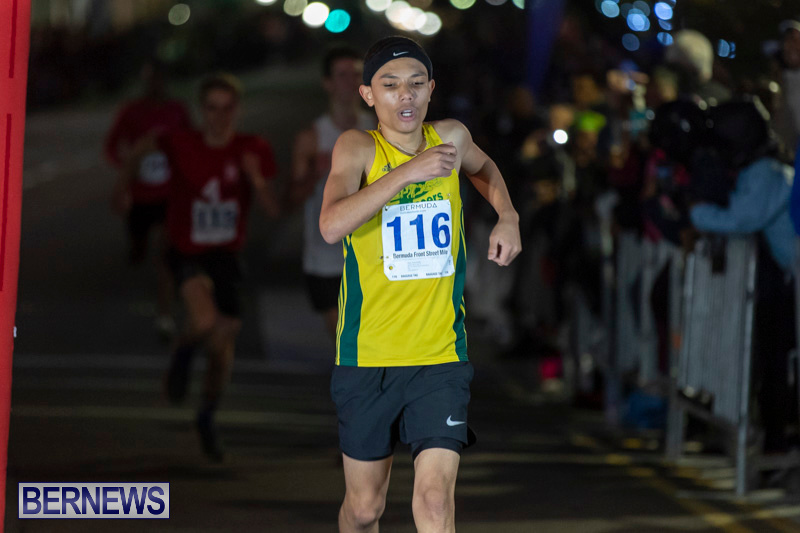 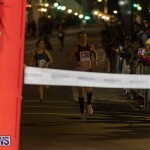 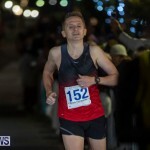 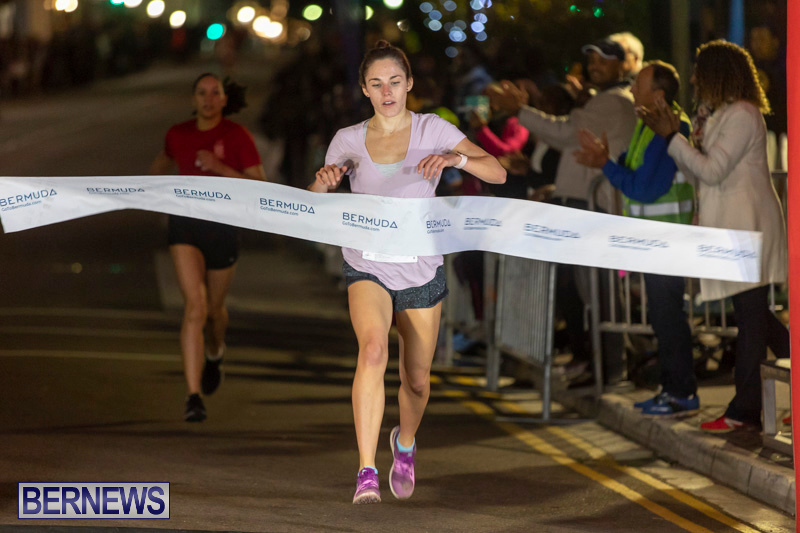 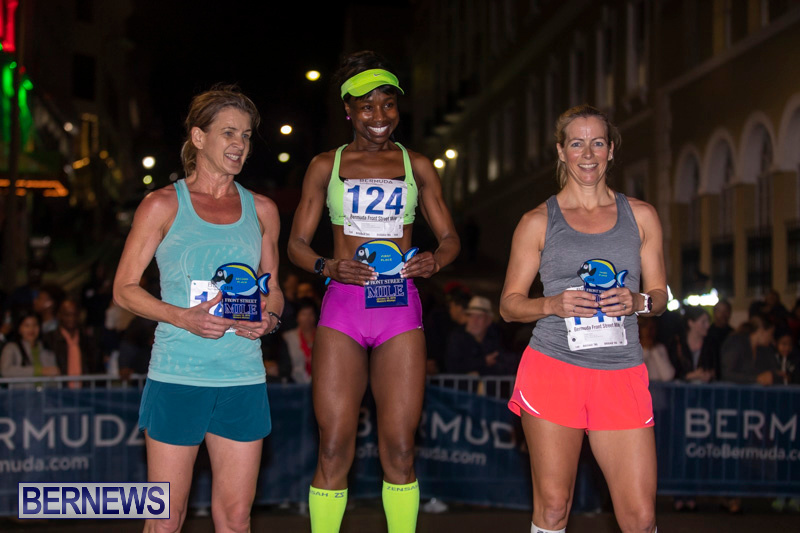 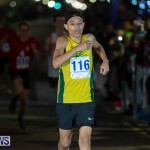 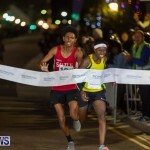 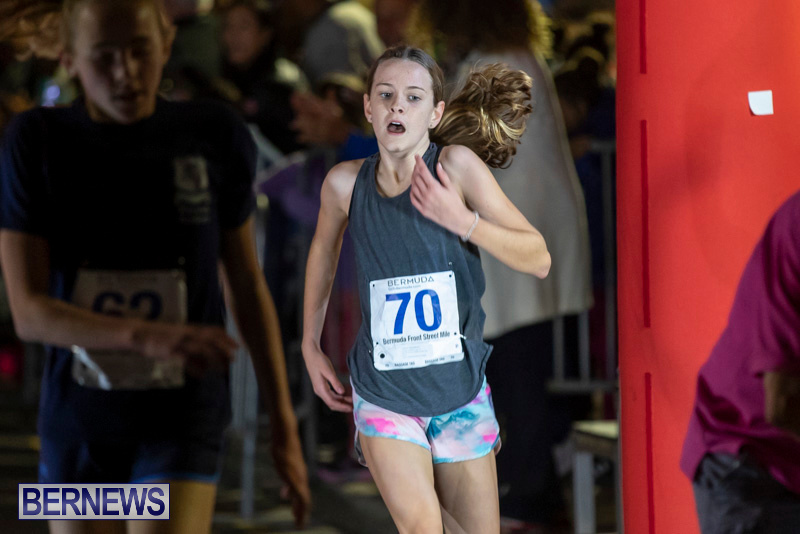 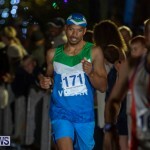 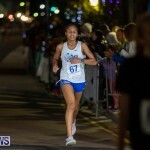 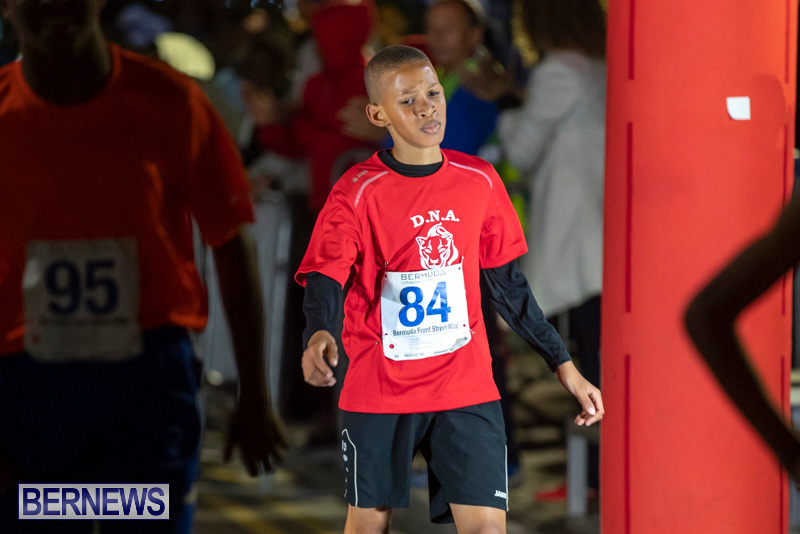 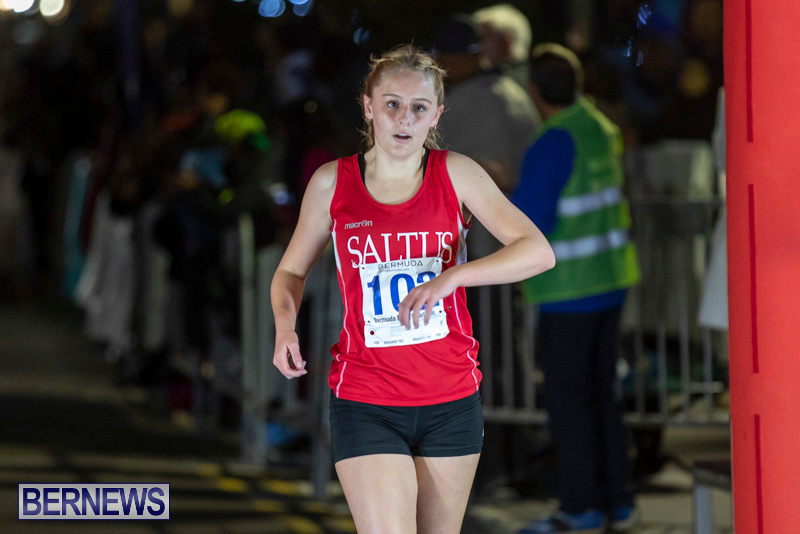 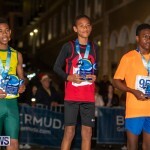 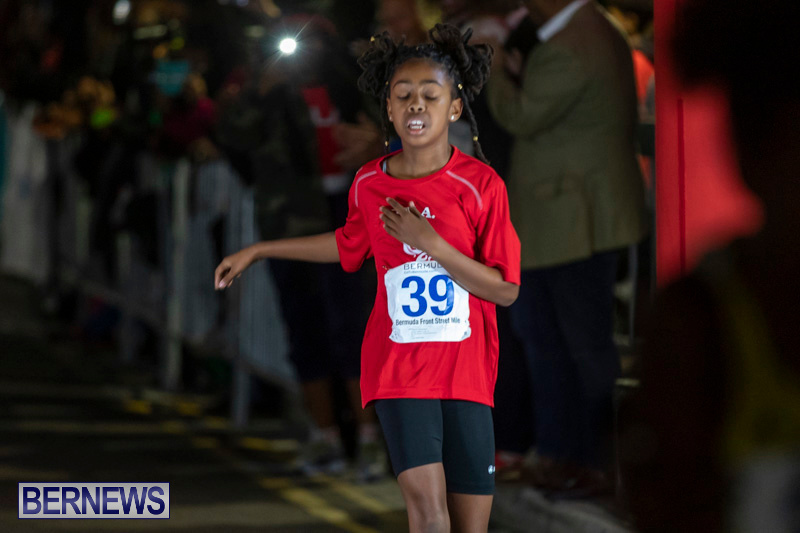 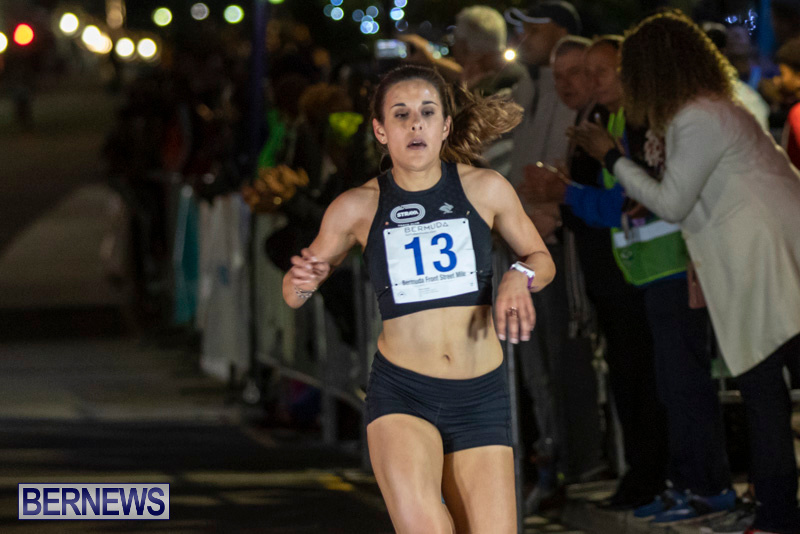 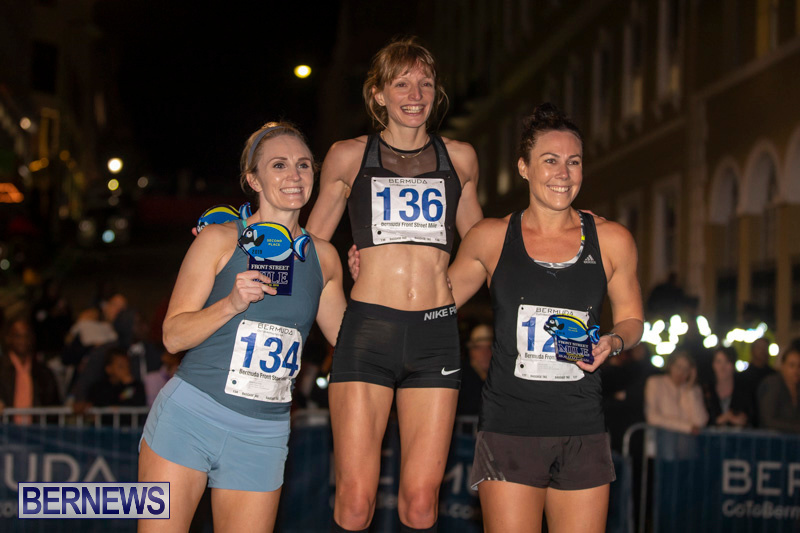 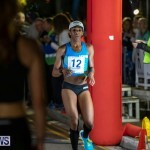 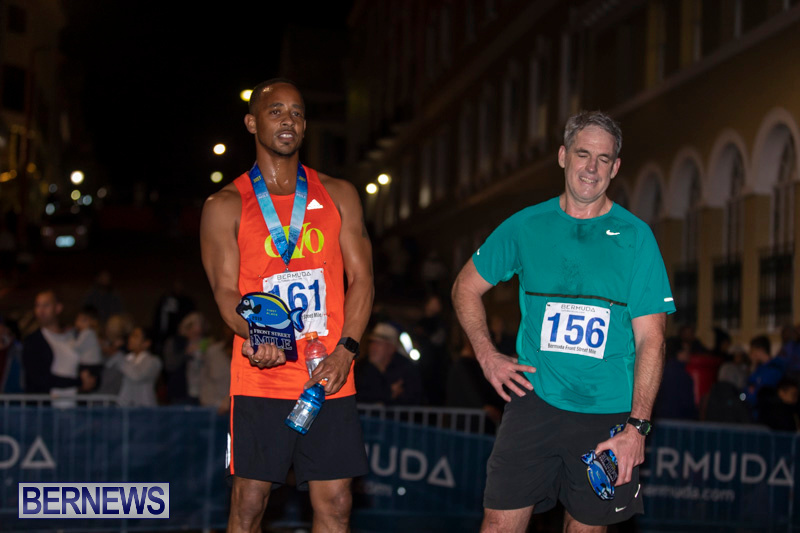 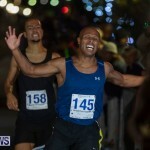 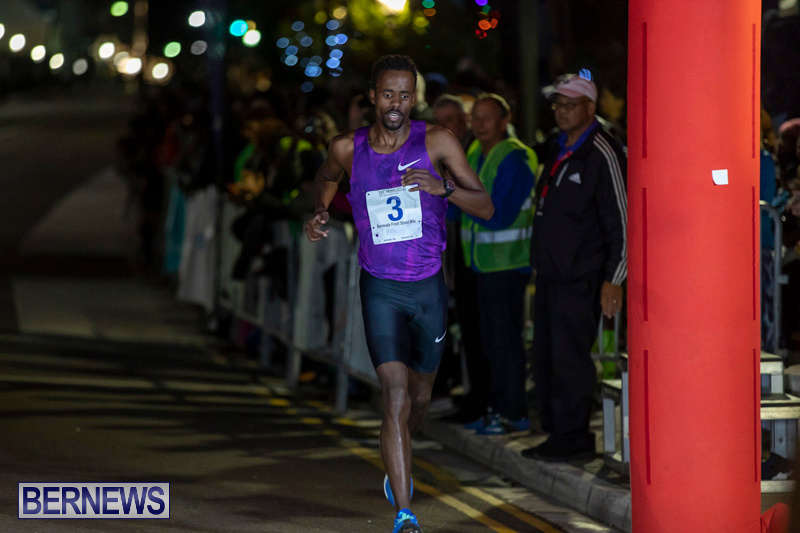 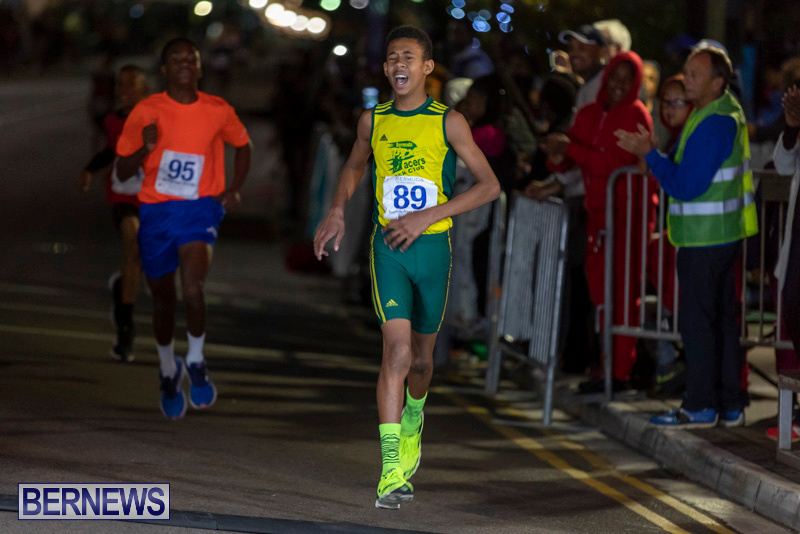 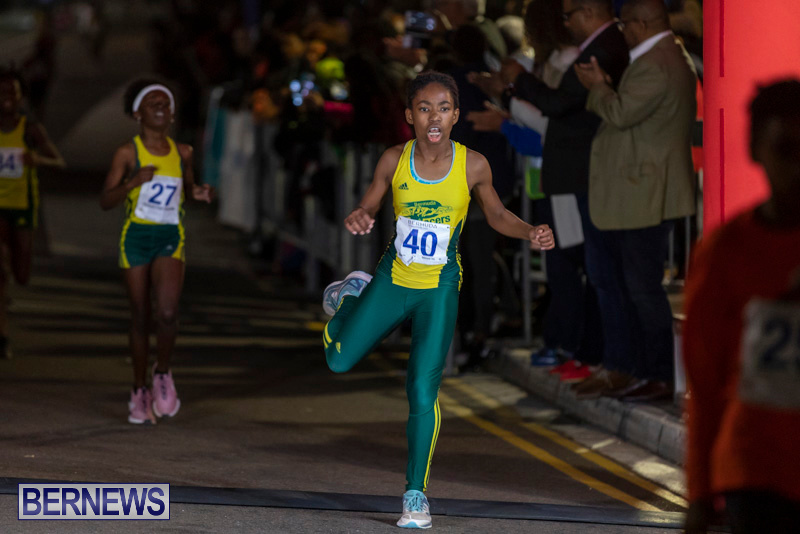 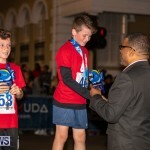 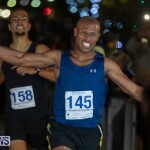 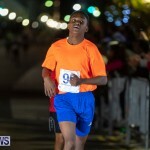 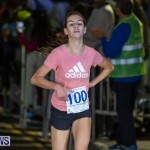 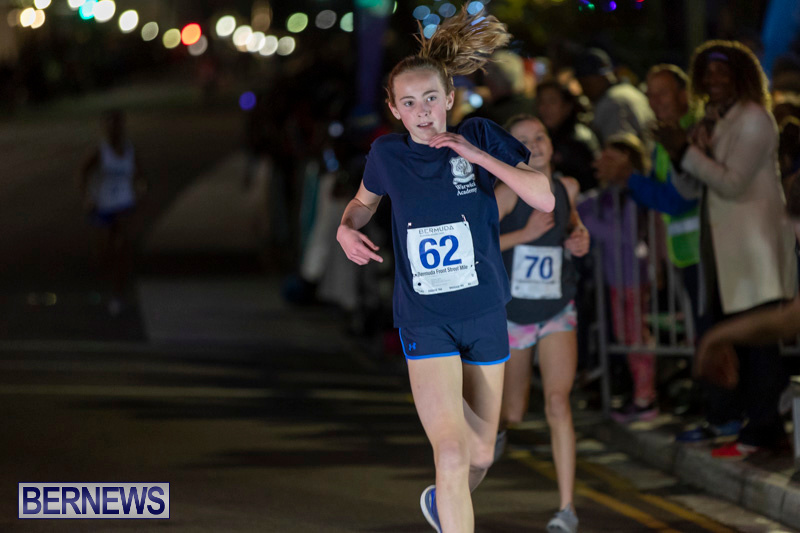 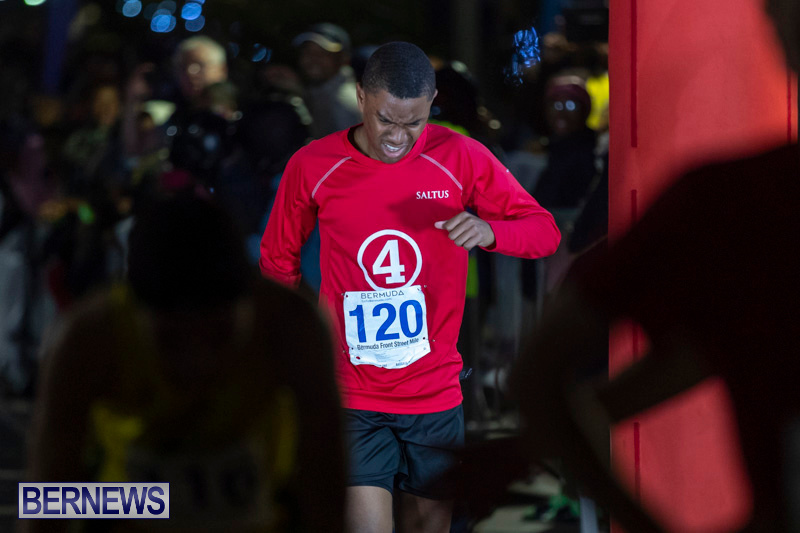 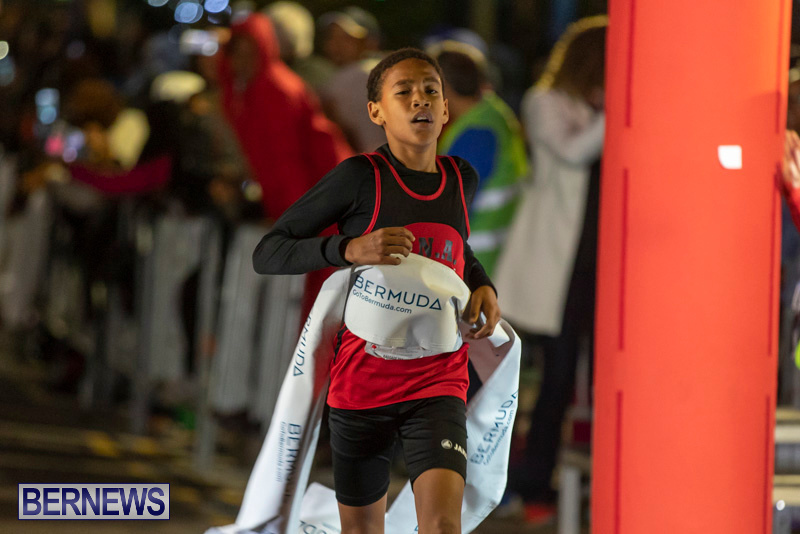 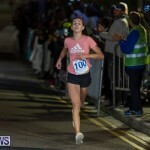 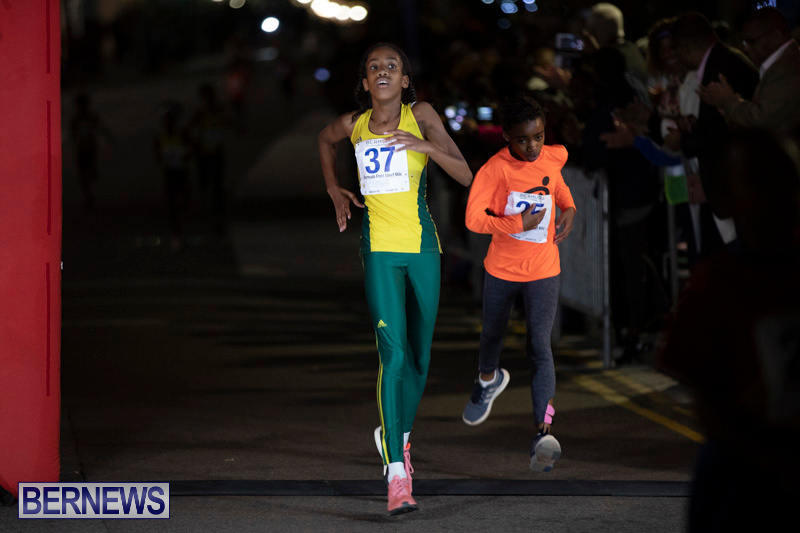 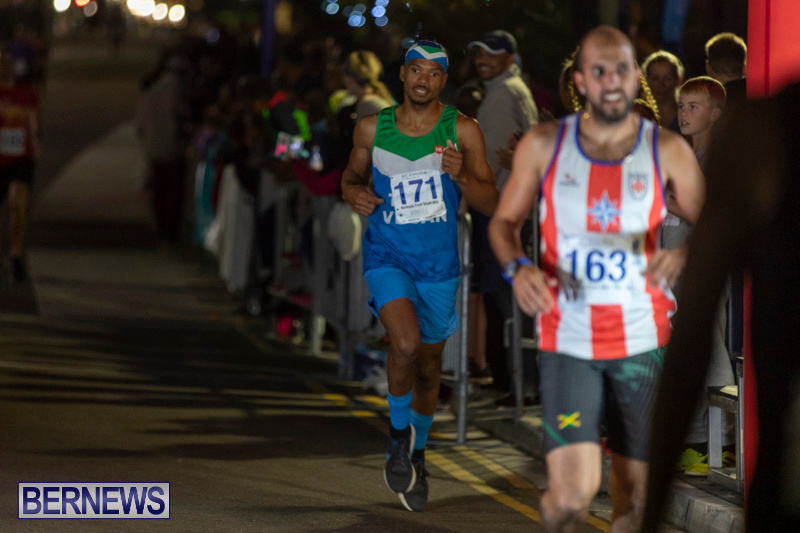 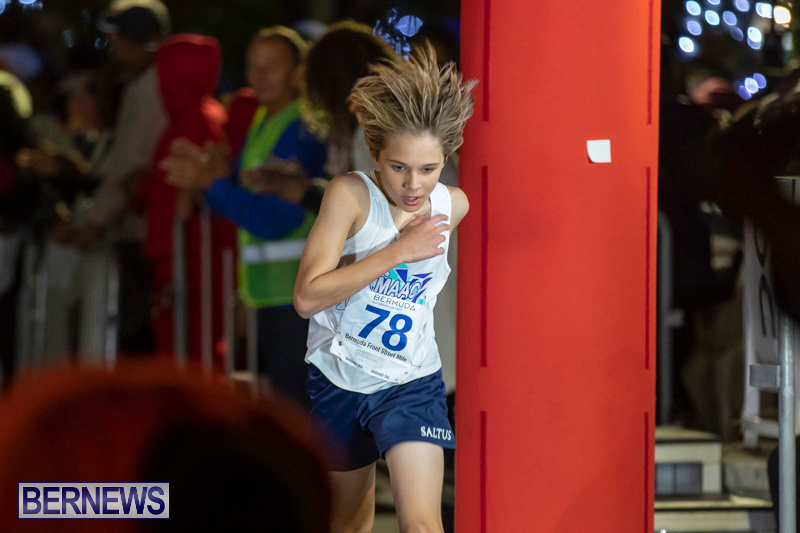 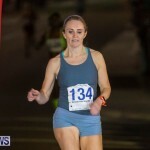 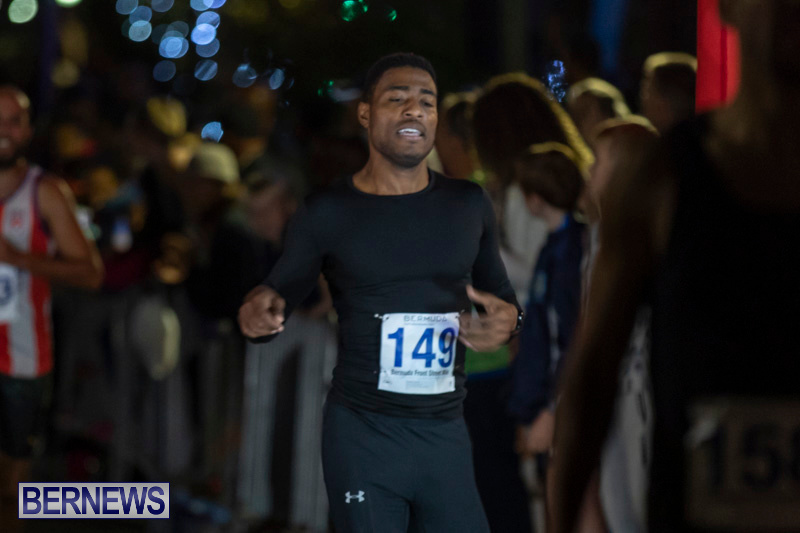 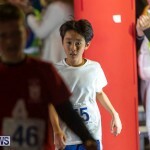 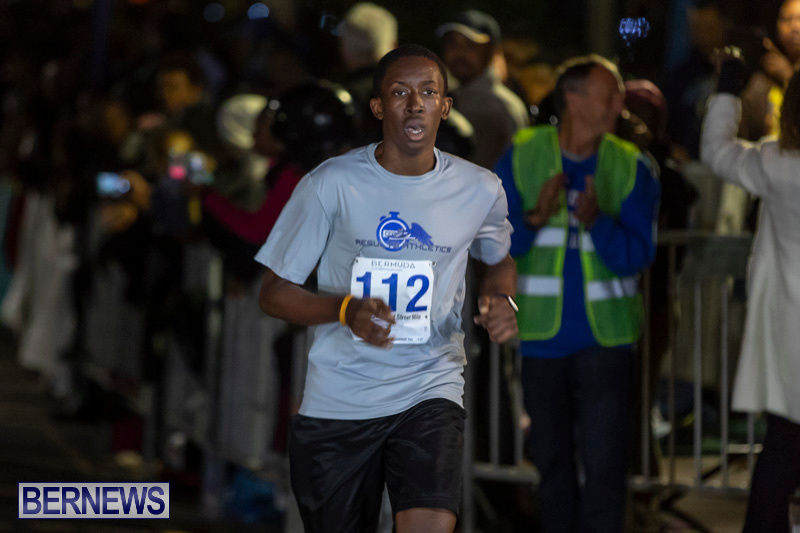 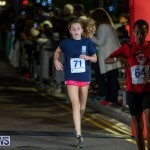 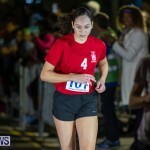 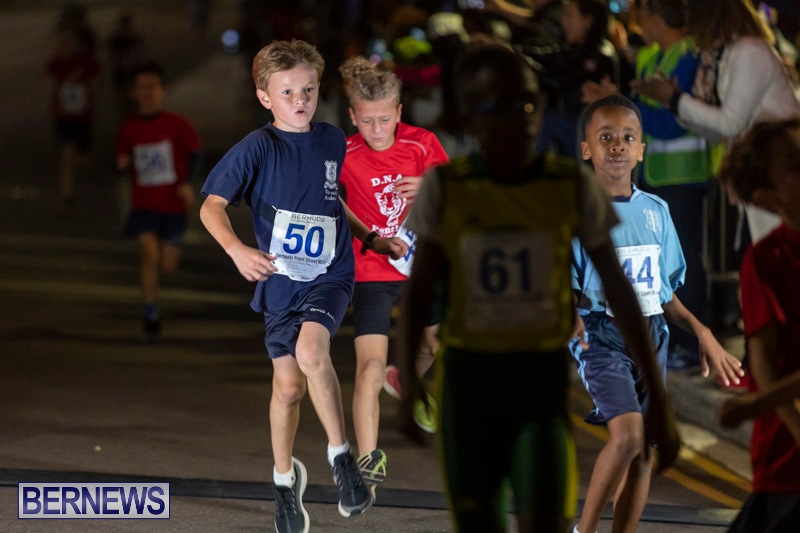 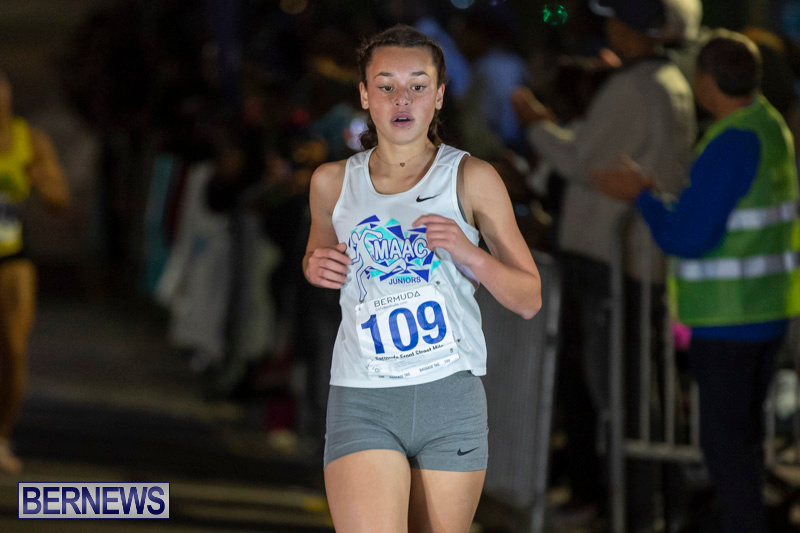 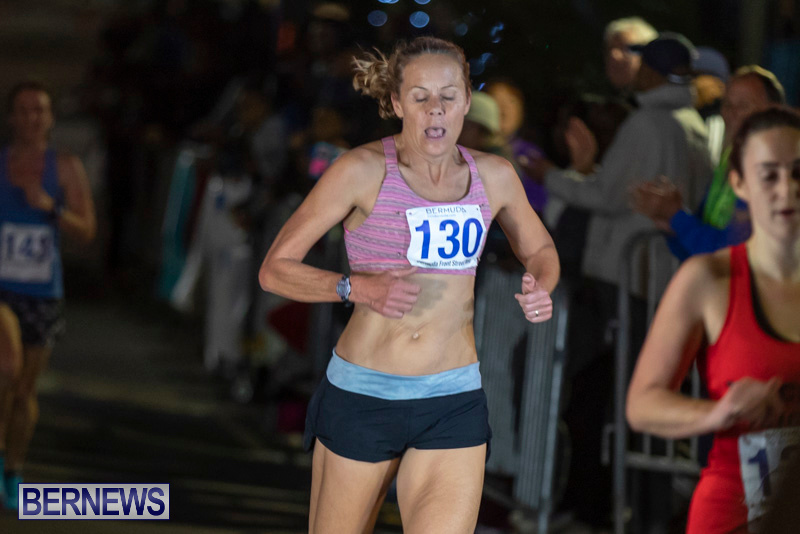 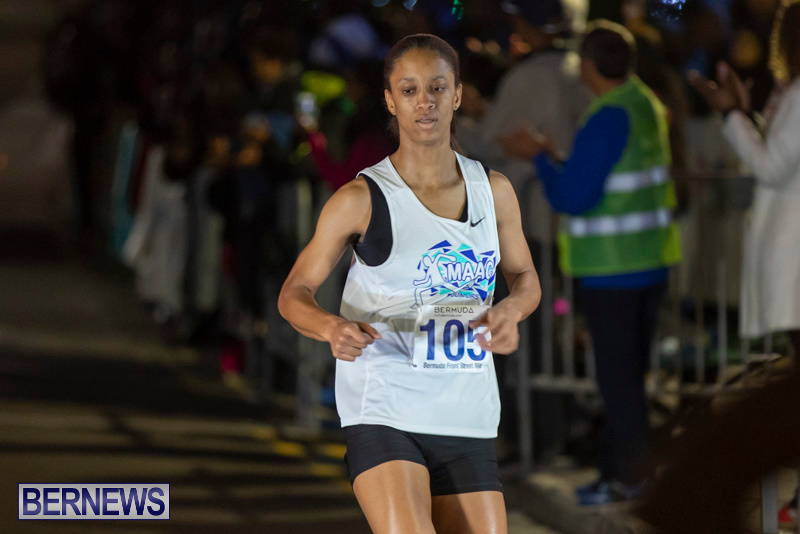 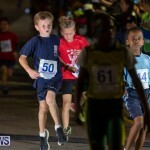 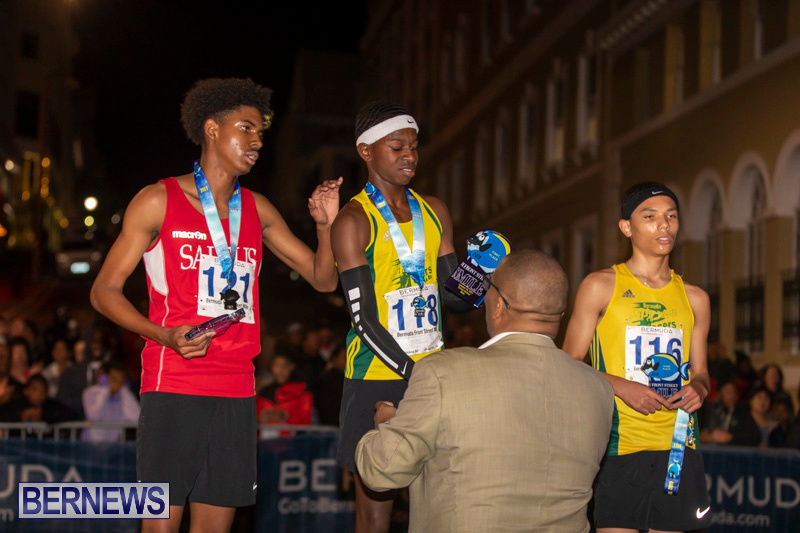 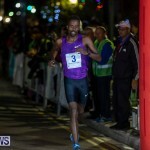 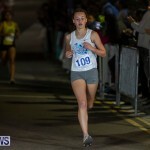 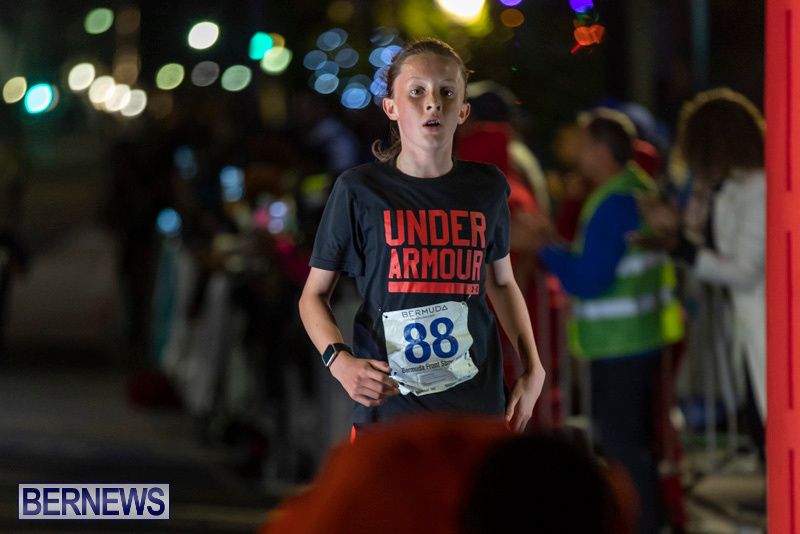 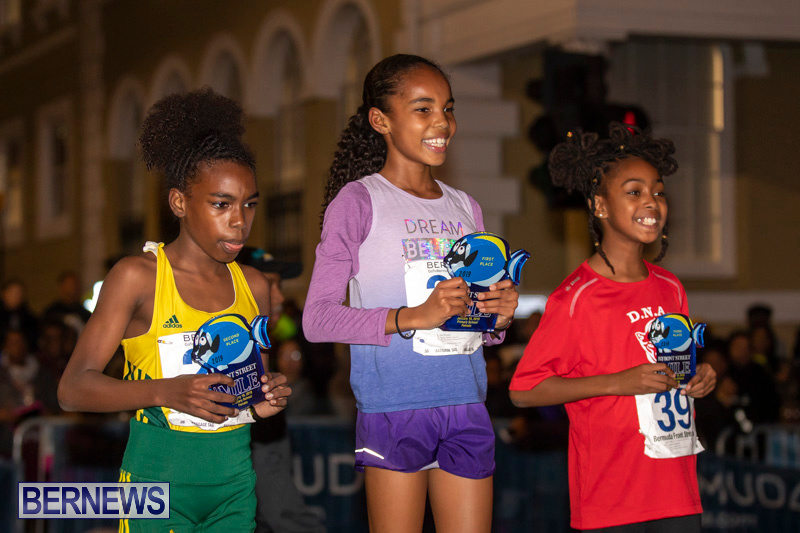 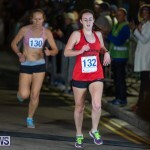 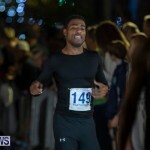 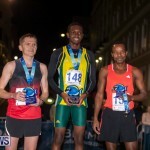 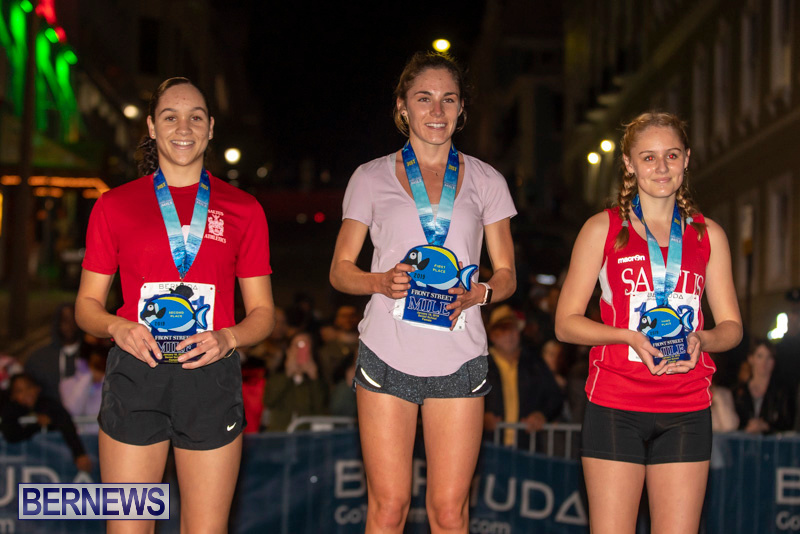 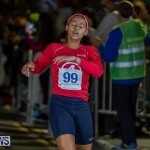 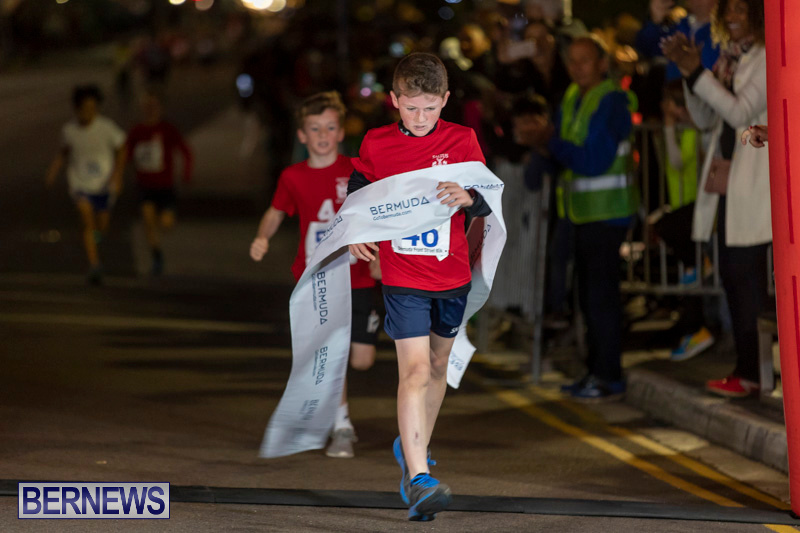 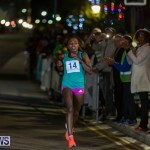 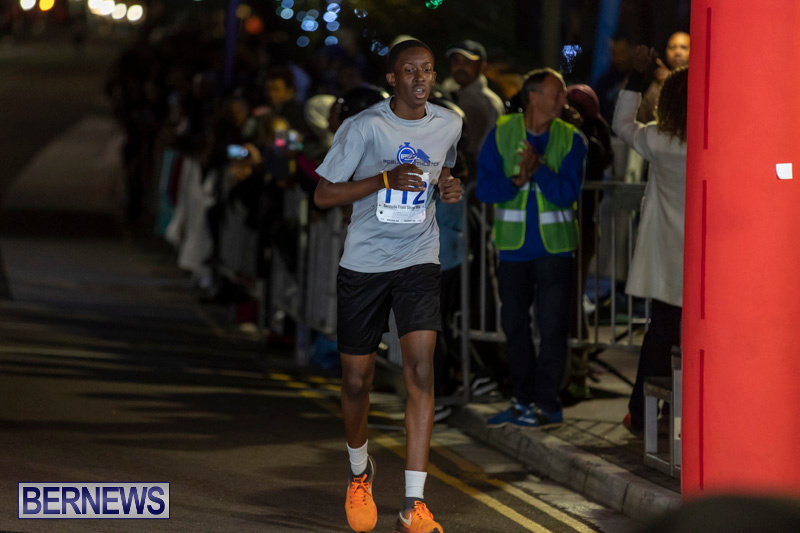 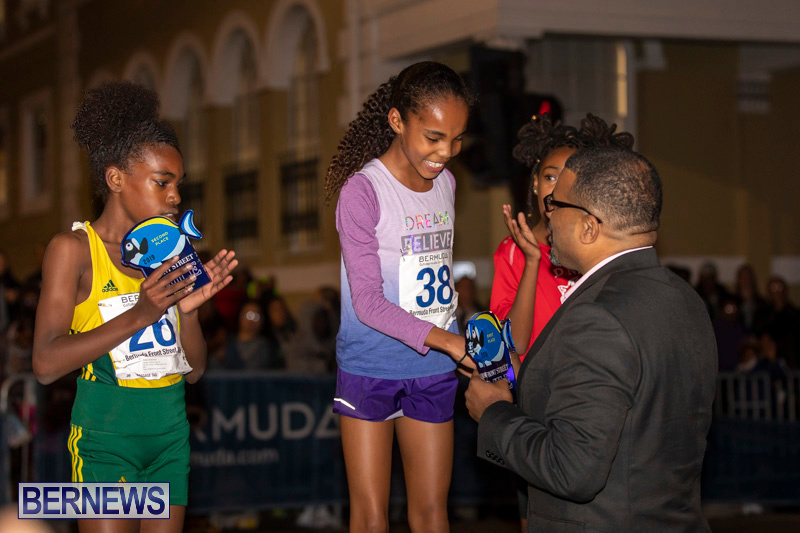 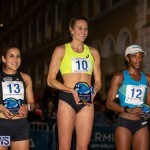 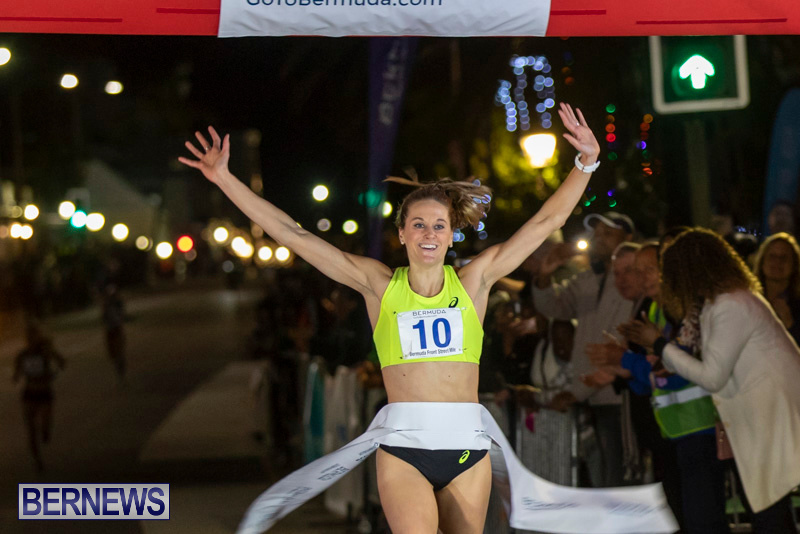 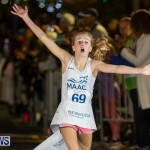 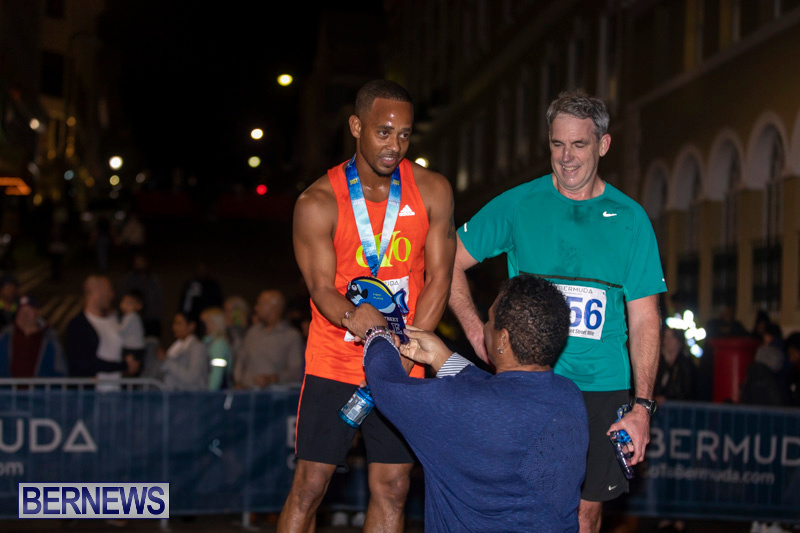 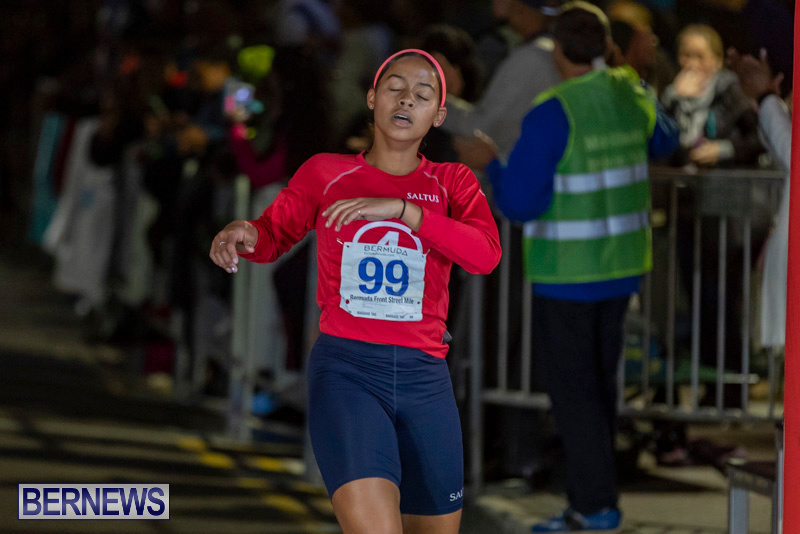 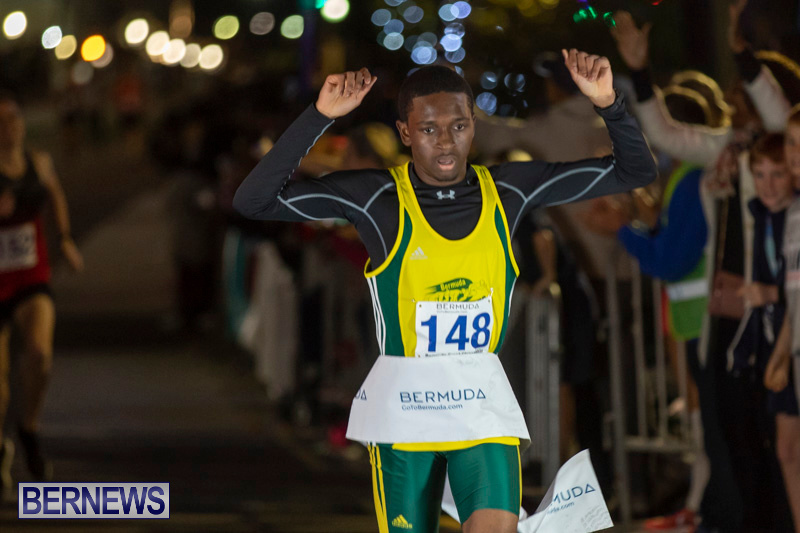 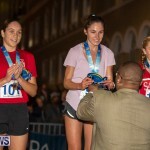 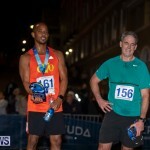 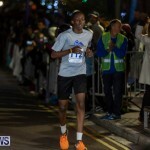 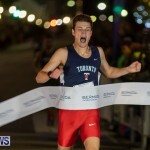 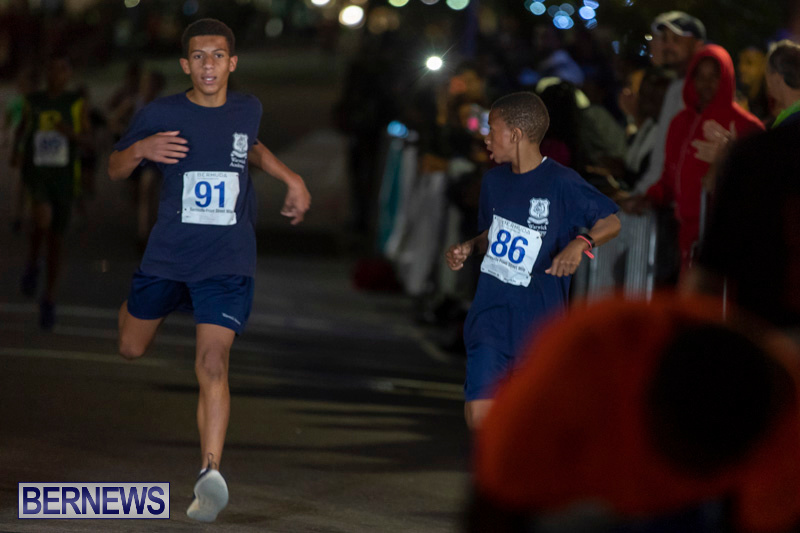 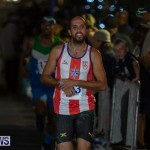 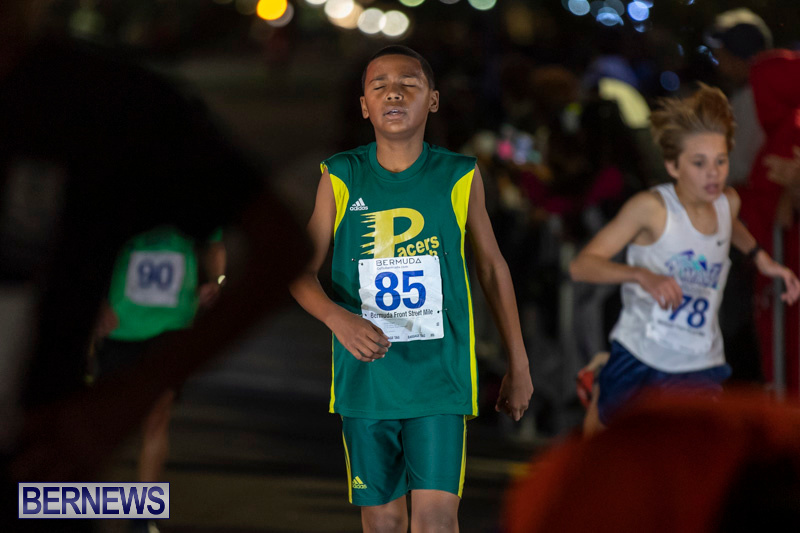 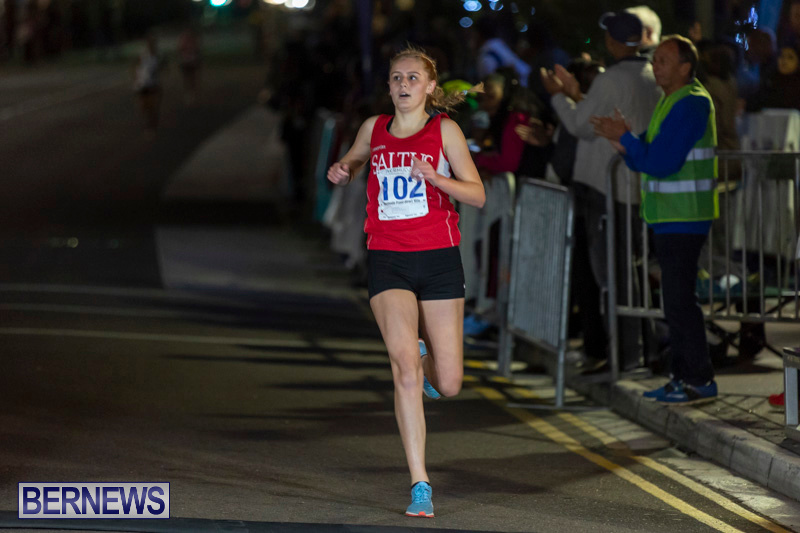 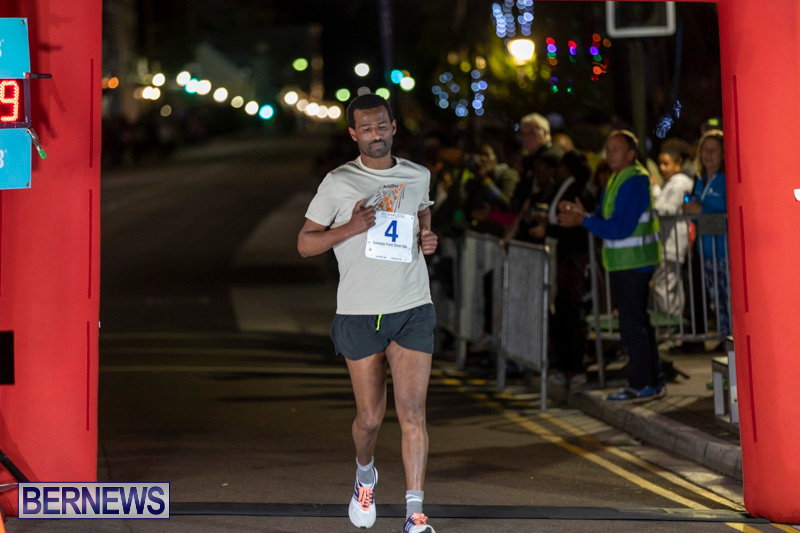 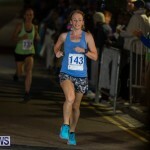 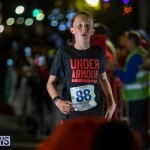 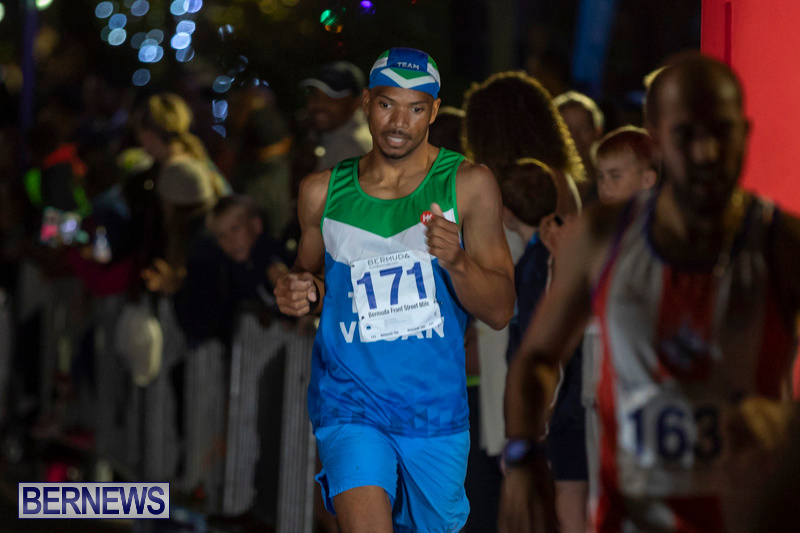 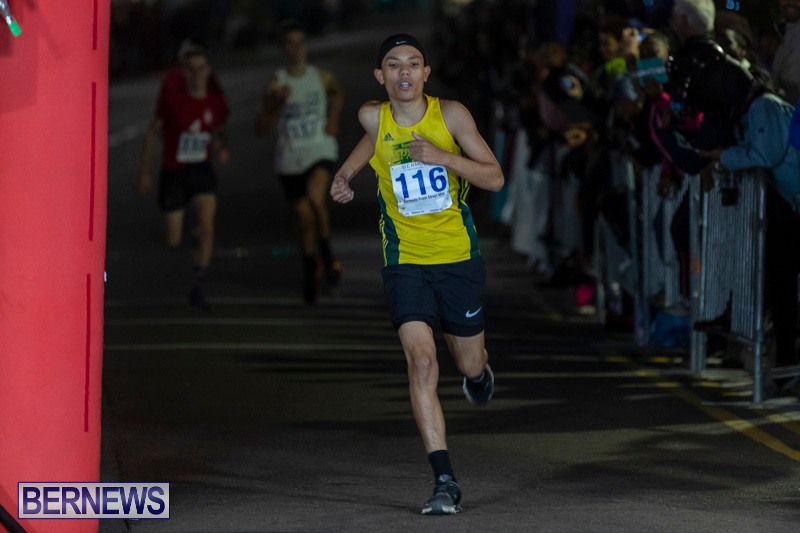 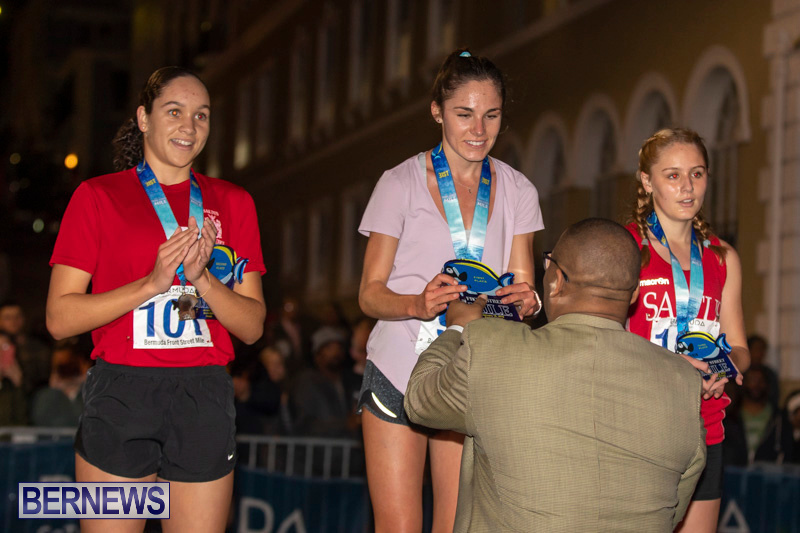 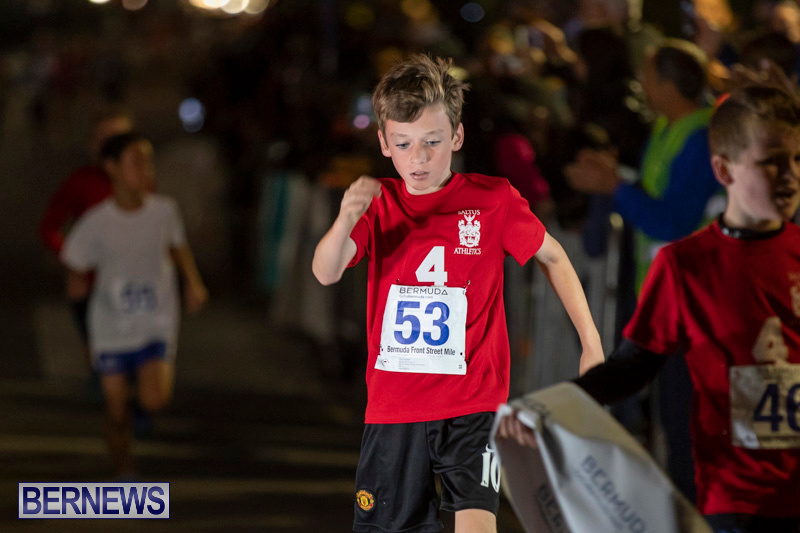 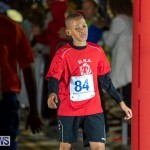 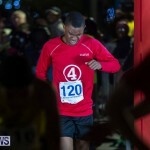 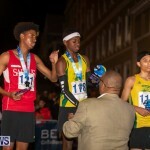 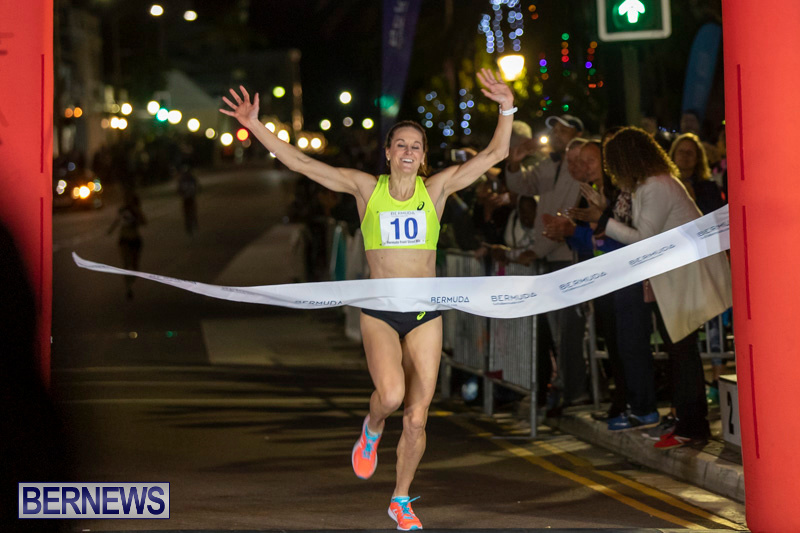 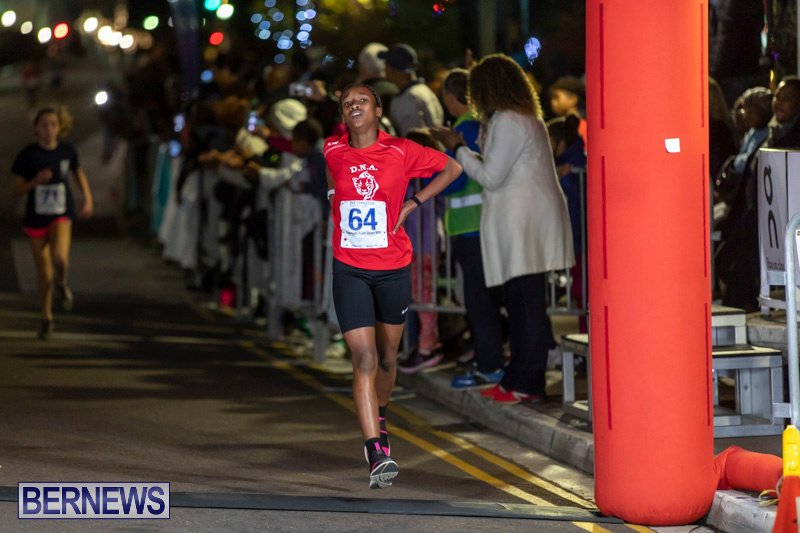 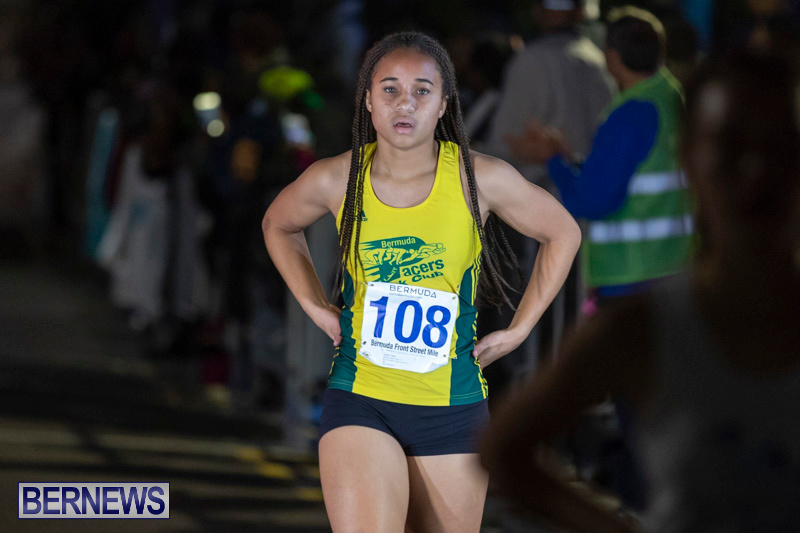 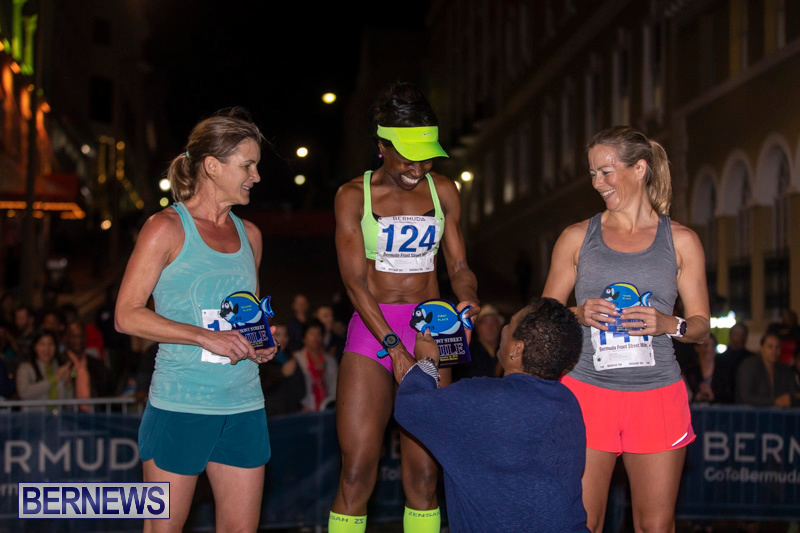 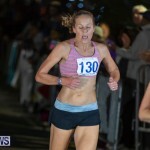 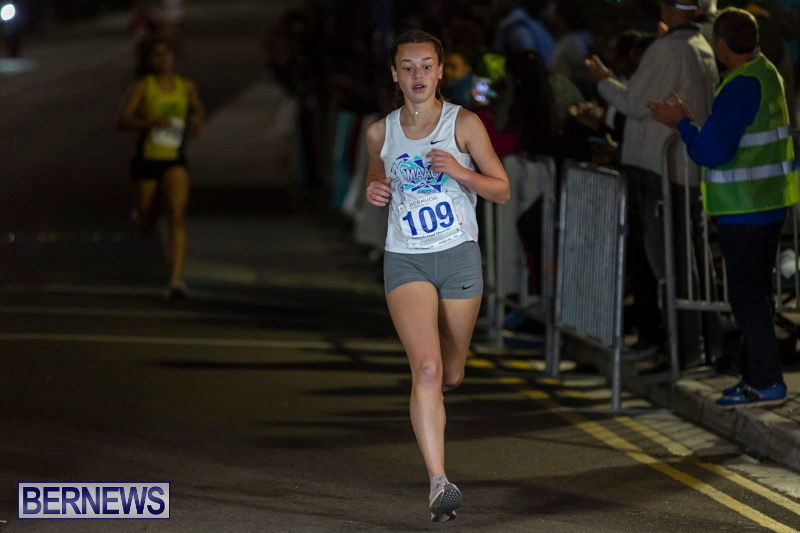 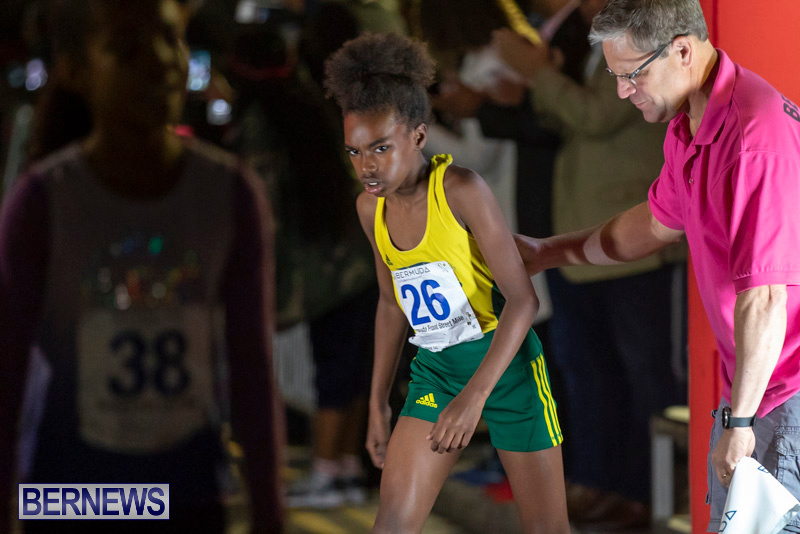 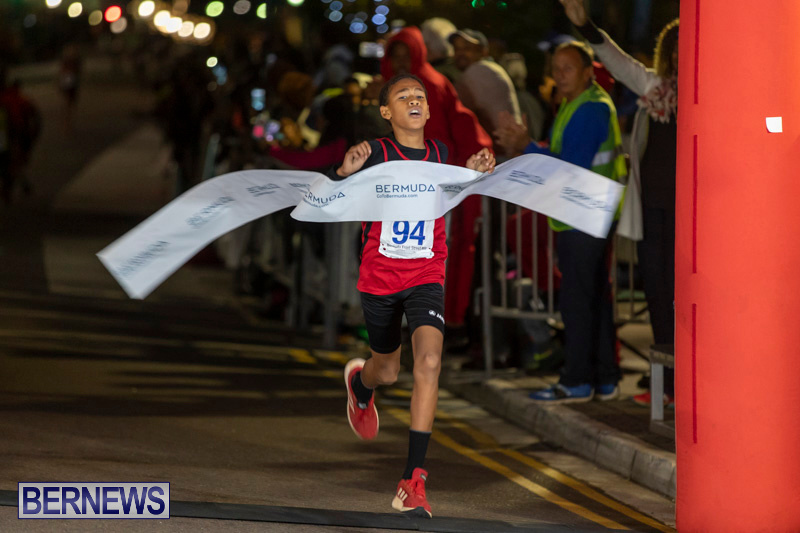 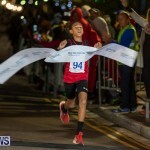 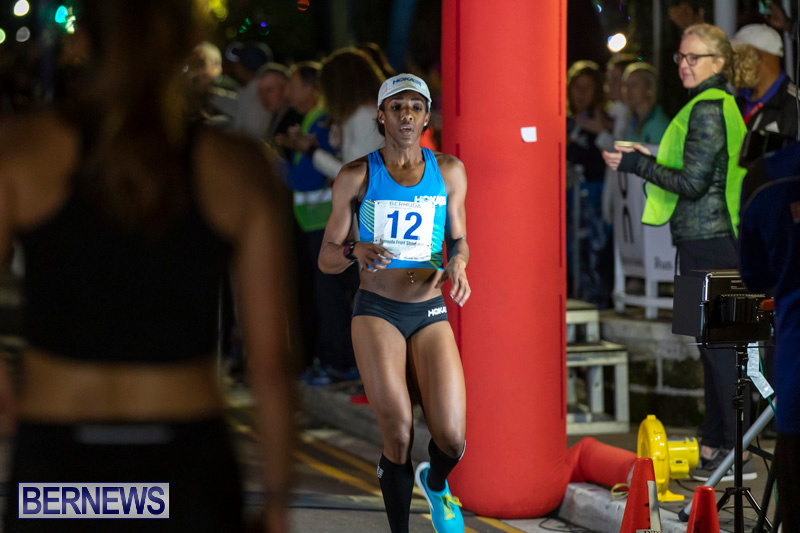 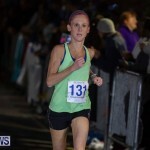 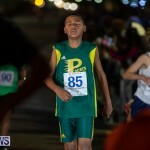 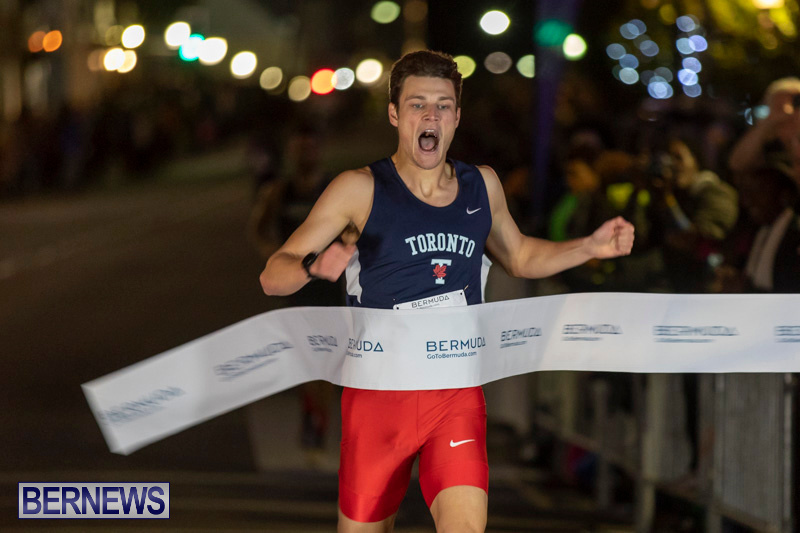 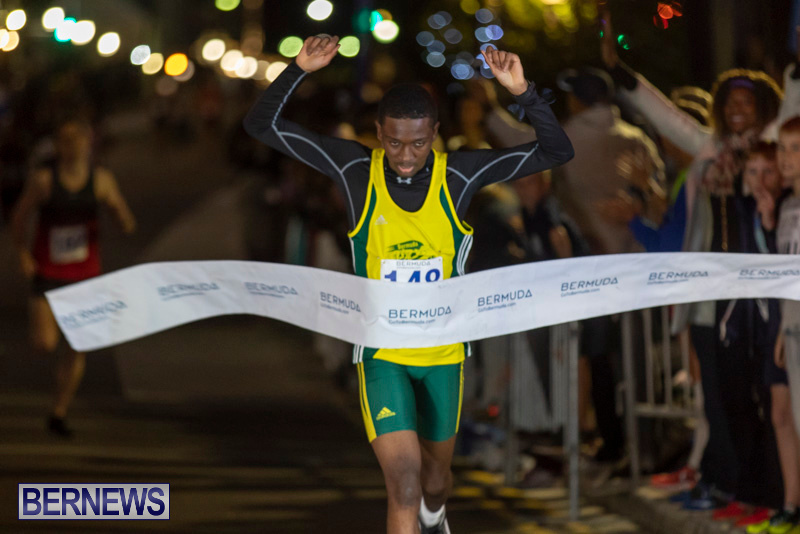 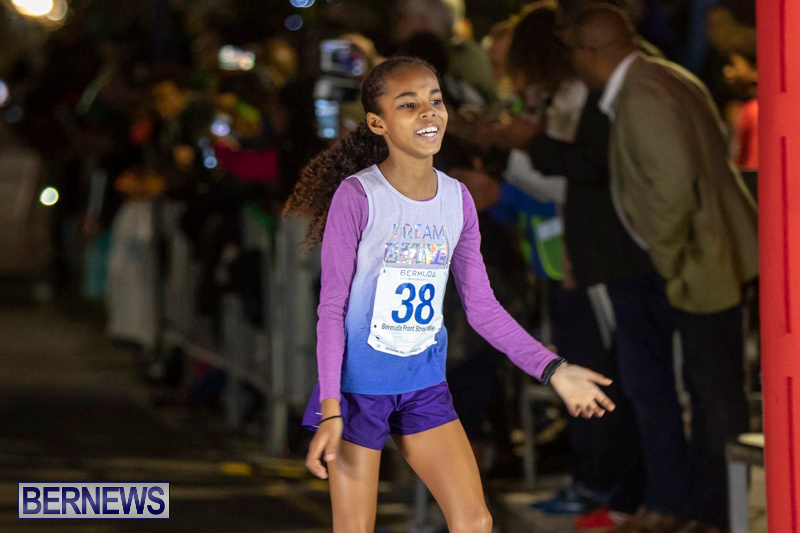 [Updated with photos] The three-day 2019 Bermuda Marathon Race Weekend got underway with the running of the Front Street Mile on Friday night. 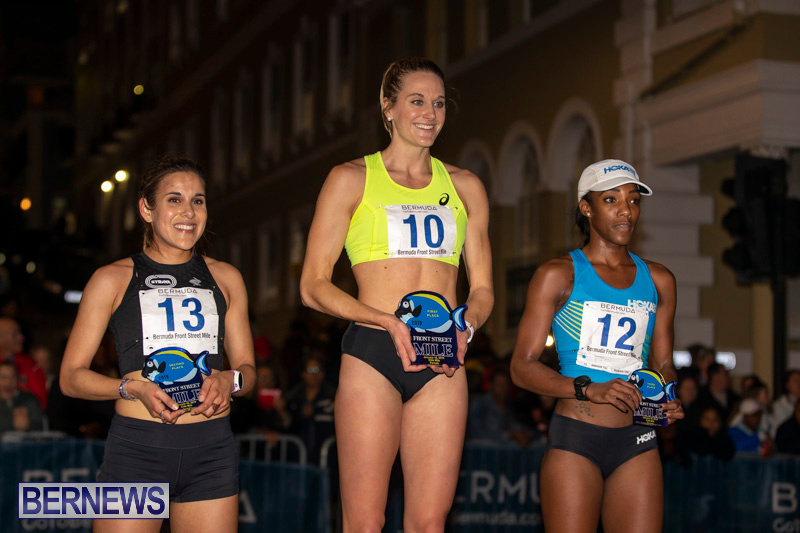 Heather Kampf won the Women’s Elite Mile clocking a time of 4:50.26, Maya Weigel was second with a time of 4:58.43 and Rolanda Bell was third in 5:02.48. 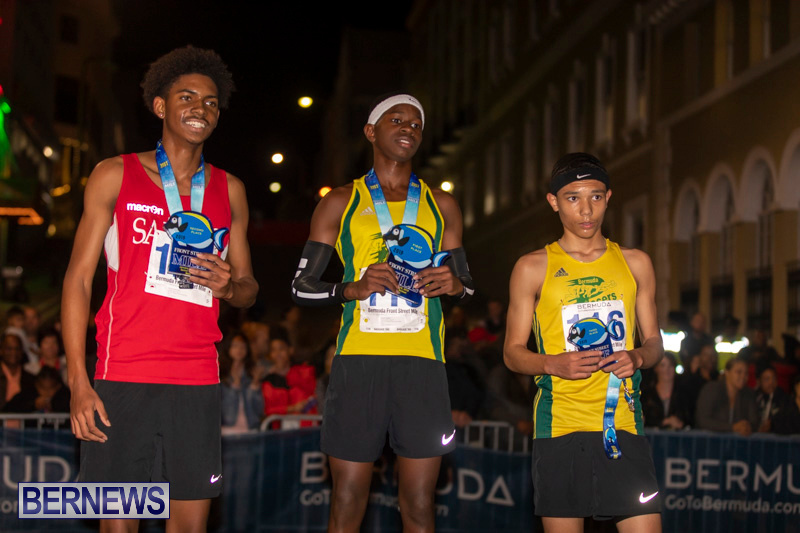 The Male Elite race saw Ethan Davenport break the tape in a winning time of 4:20.20, Sachs Smart was second in 4:24.44 and Suleman Shifa crossed the line third stopping the clock in 4:32.78. 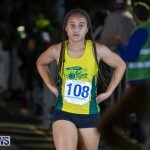 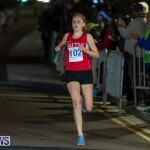 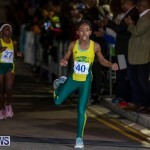 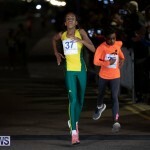 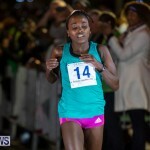 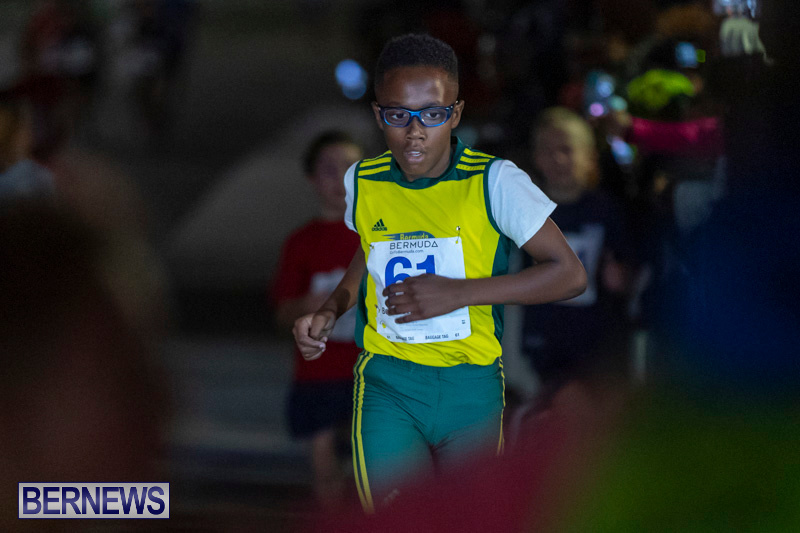 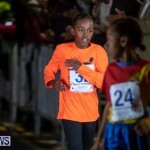 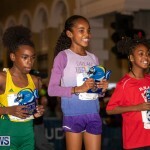 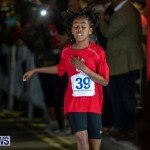 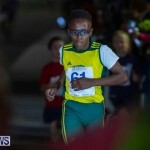 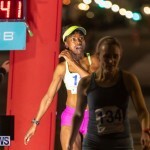 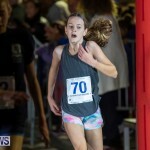 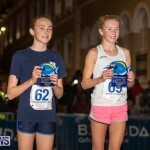 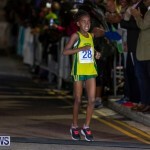 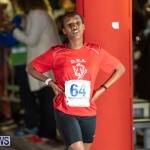 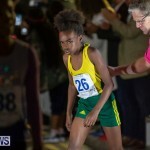 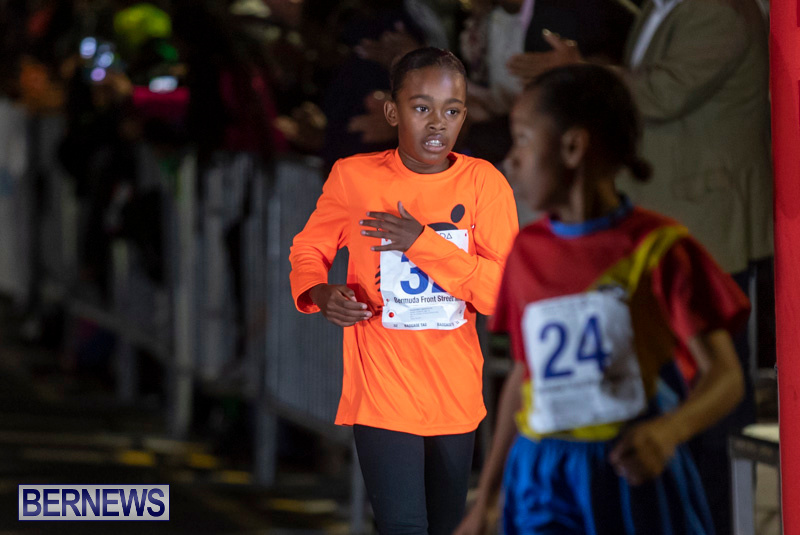 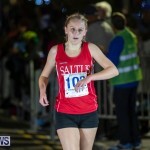 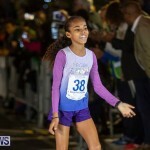 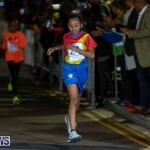 The Primary School Girls Record that had stood for more than 20 years was broken when Ziza Russell crossed the line in a time of 5:39.77, Ellise Dickinson was second in 5:44.60 and Legend Stevenson finished third clocking 5:56.82. 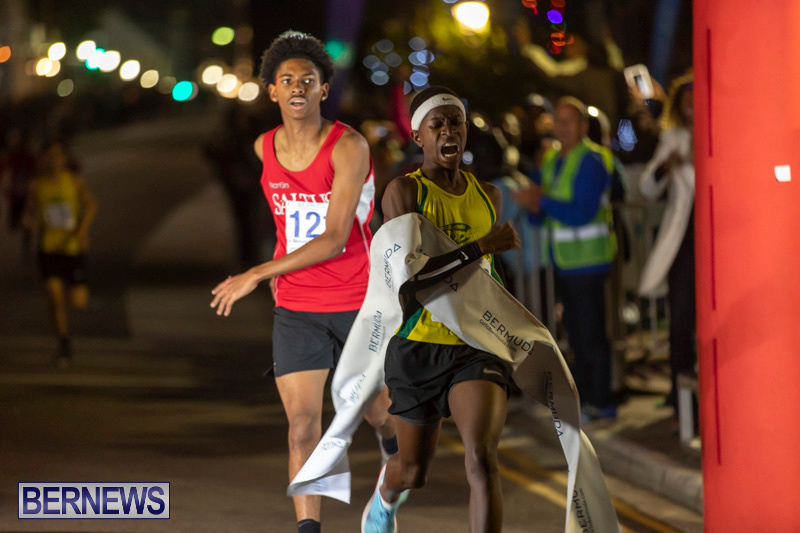 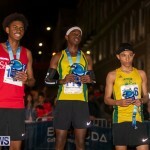 The closest finish of the night came during the Senior School Boys race as Kahzi Sealey and Nirobi Smith-Mills were both clocked across the line in a time of 4:47.97, with Sealey declared the winner, while Ryan Outerbridge finished third in a time of 4:51.65.